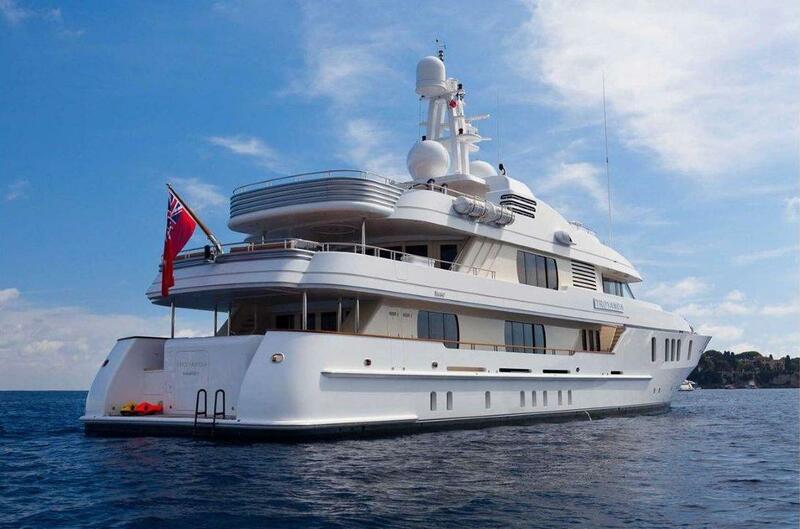 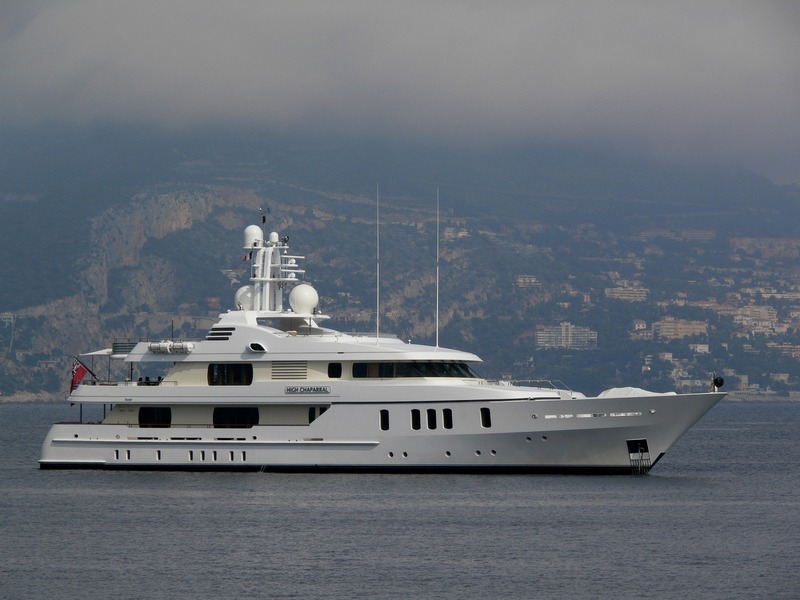 Luxury motor yacht HANIKON (ex Troyanda, High Chaparral) is a 49,9 m Feadship superyacht launched in 2004. 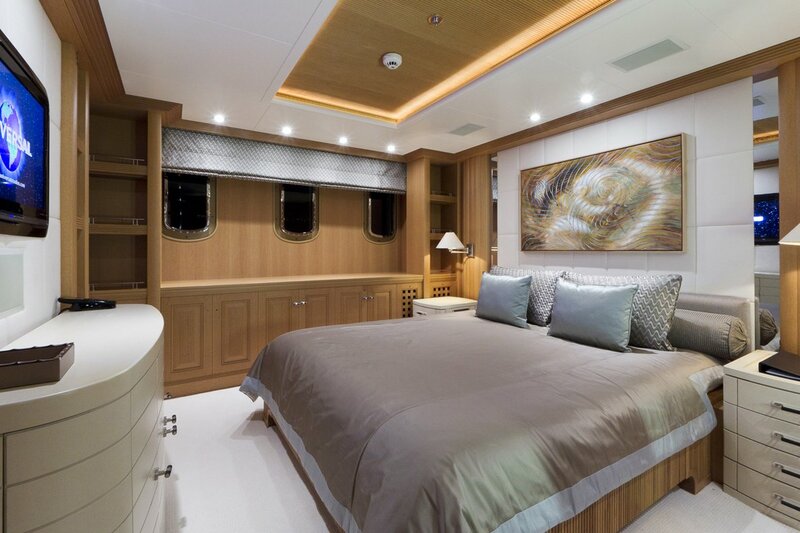 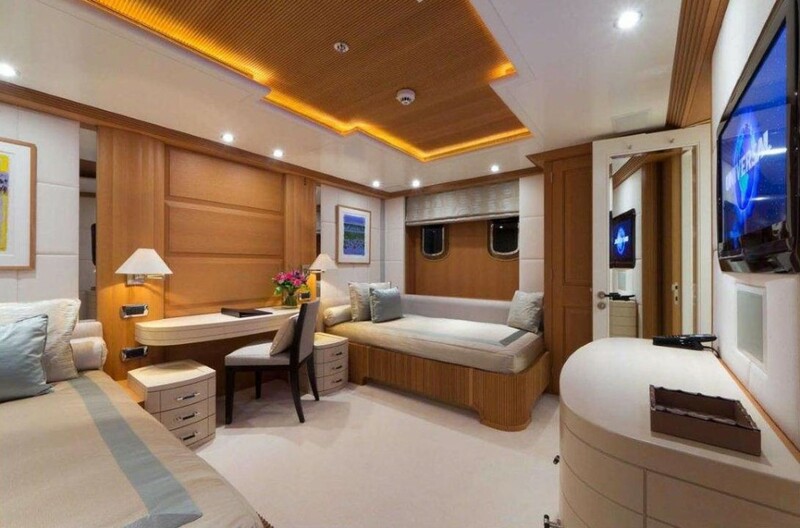 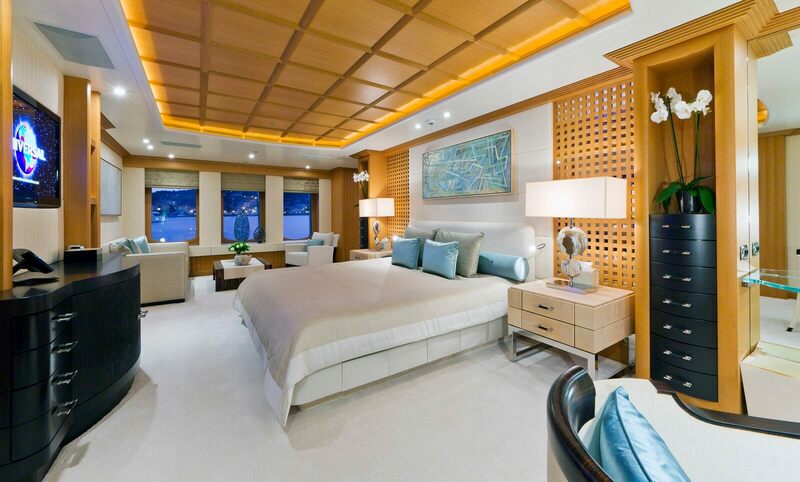 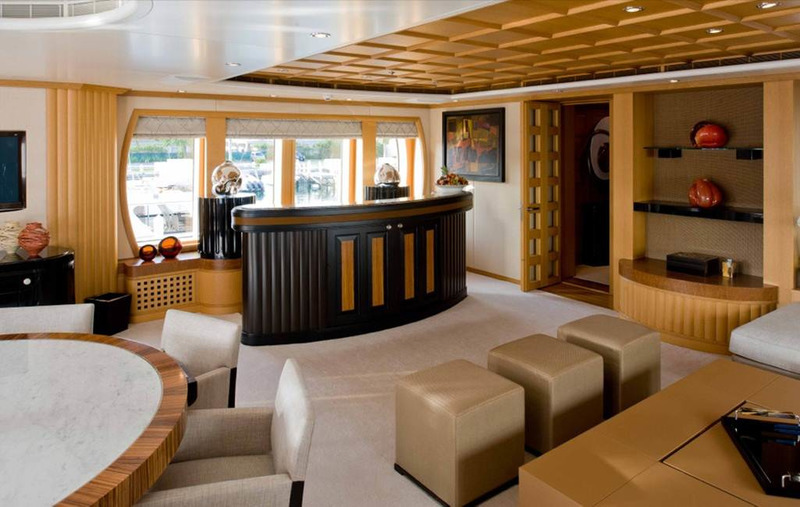 This impressive yacht feature interior by HB Design and provides excellent cruising experience with reduced noise and vibration. 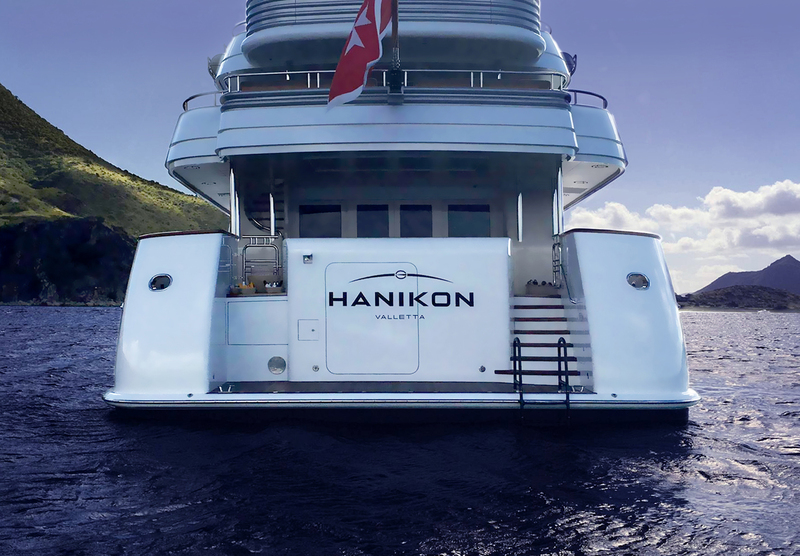 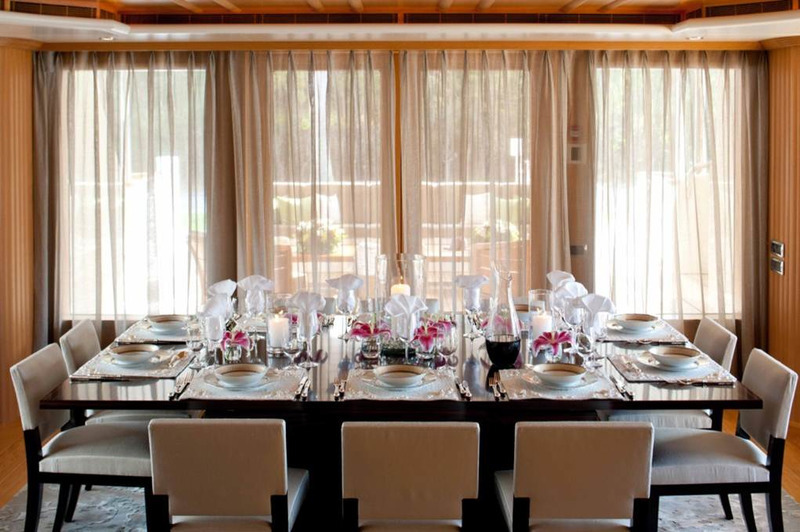 HANIKON can accommodate 12 guests in 6 cabins. 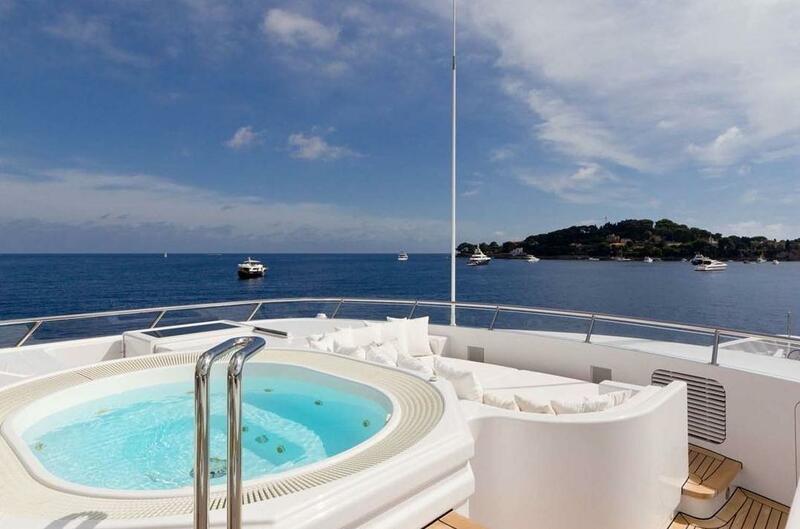 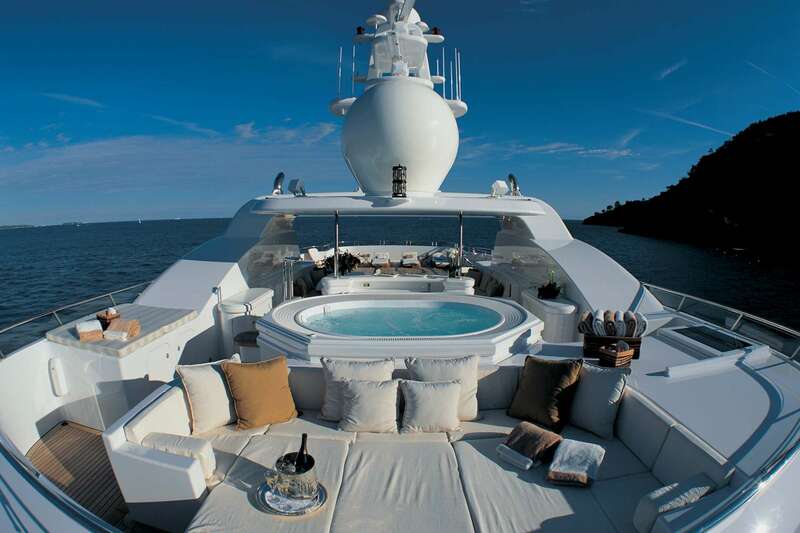 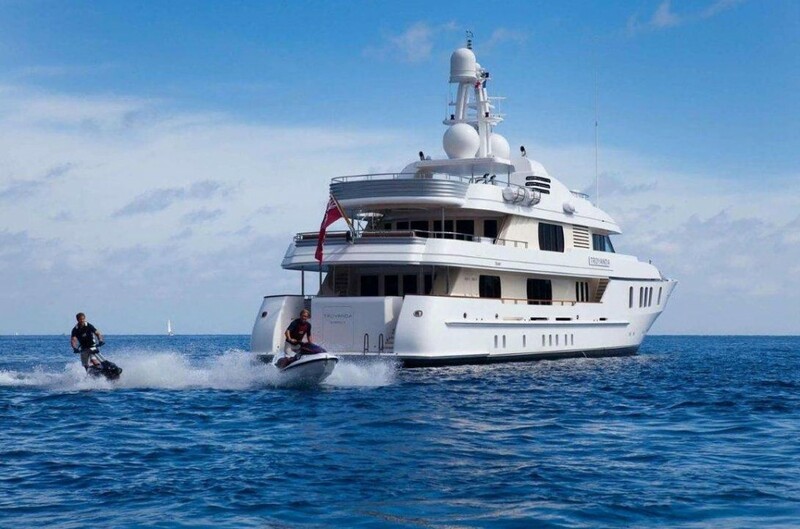 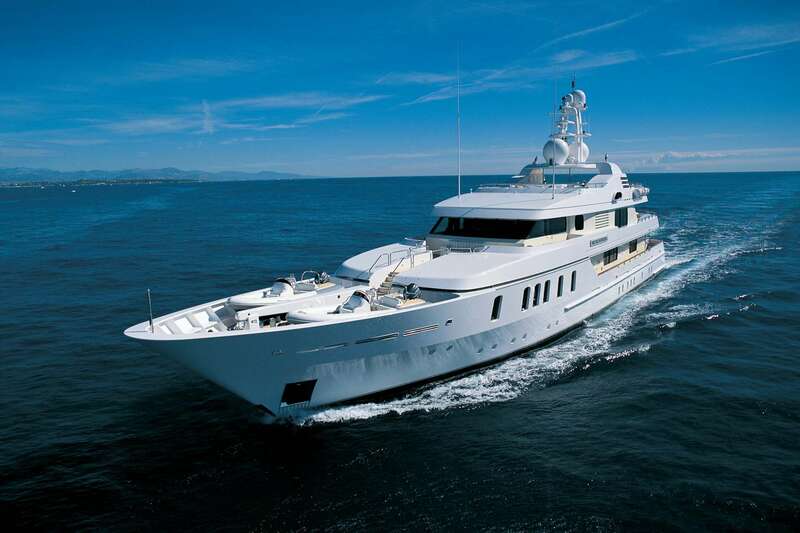 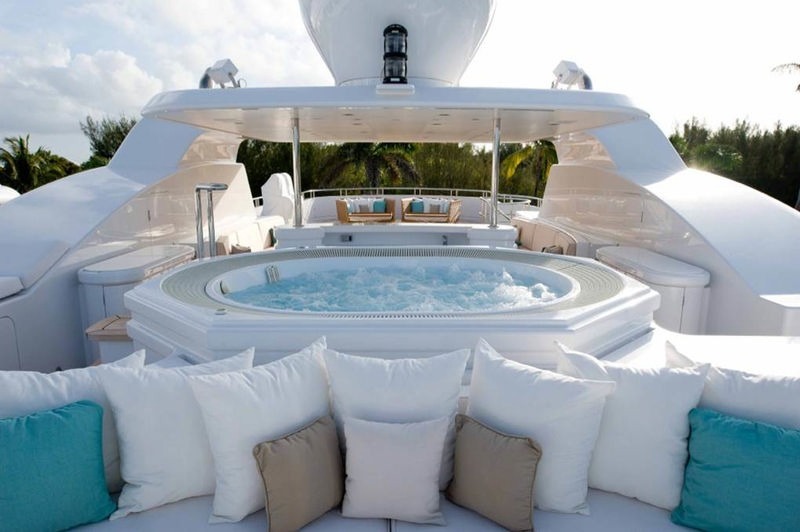 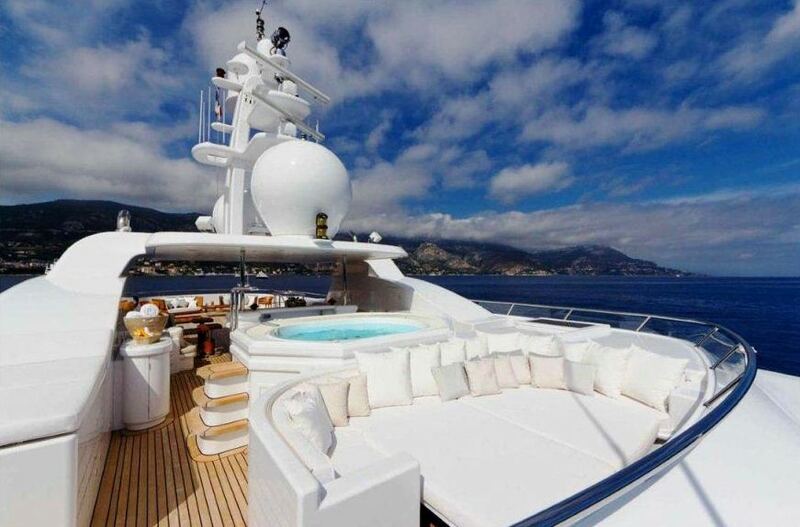 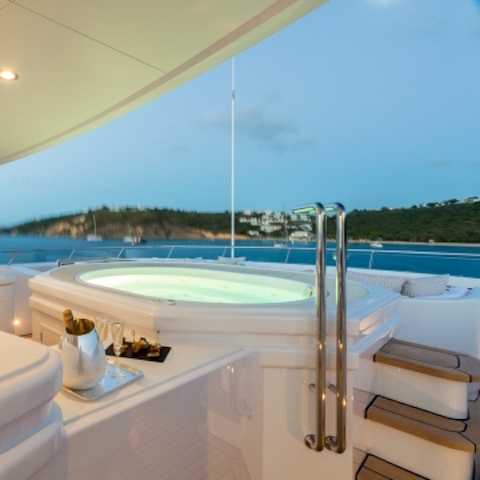 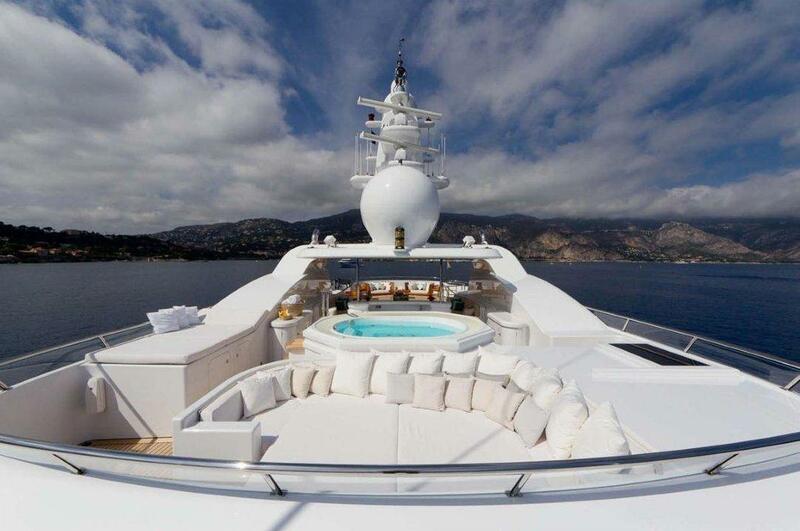 She is the outcome of her owner's search for perfection and is a highly reputable charter yacht. 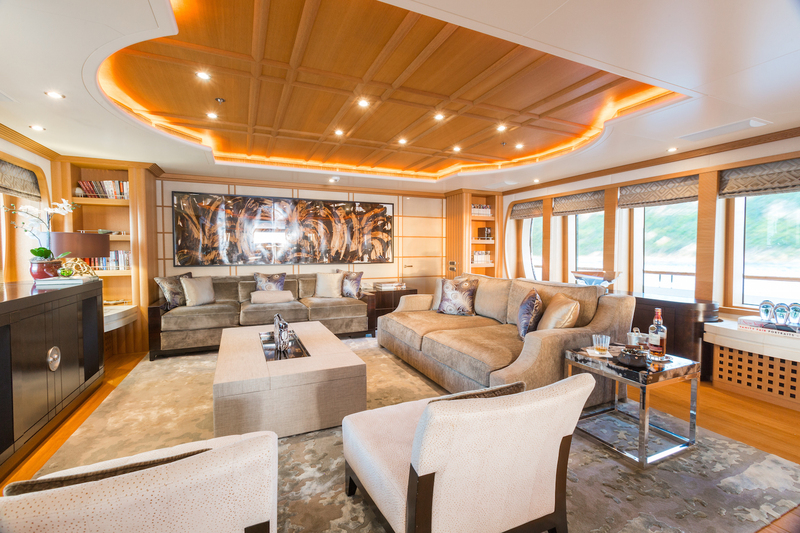 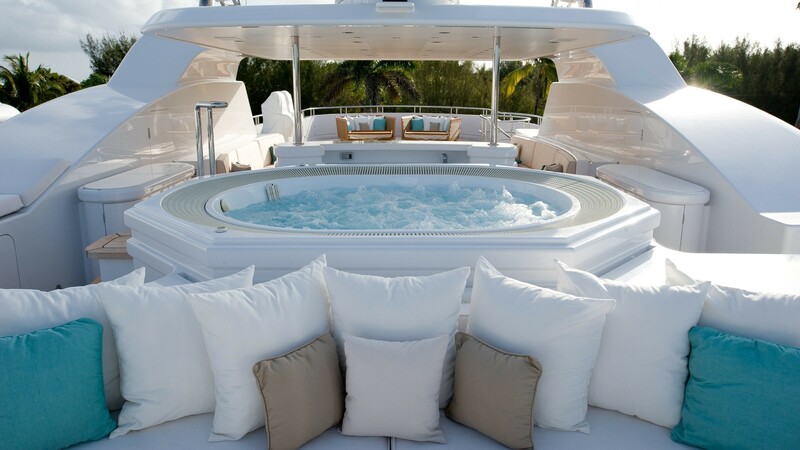 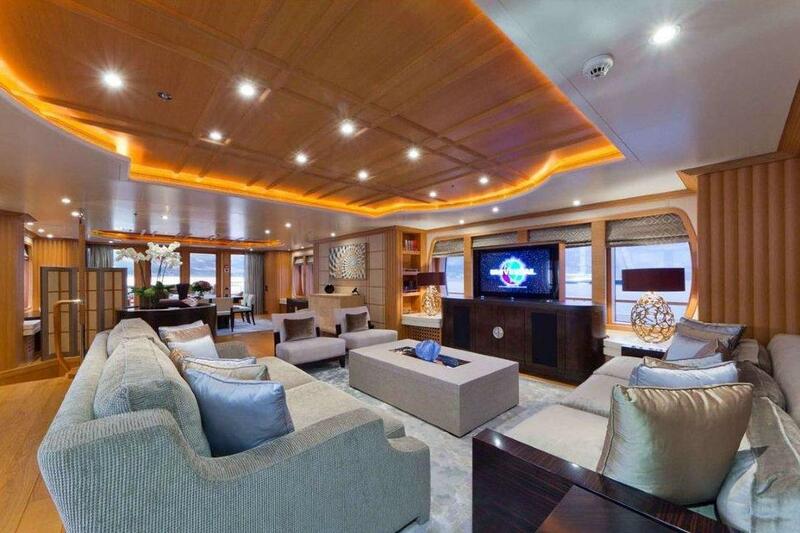 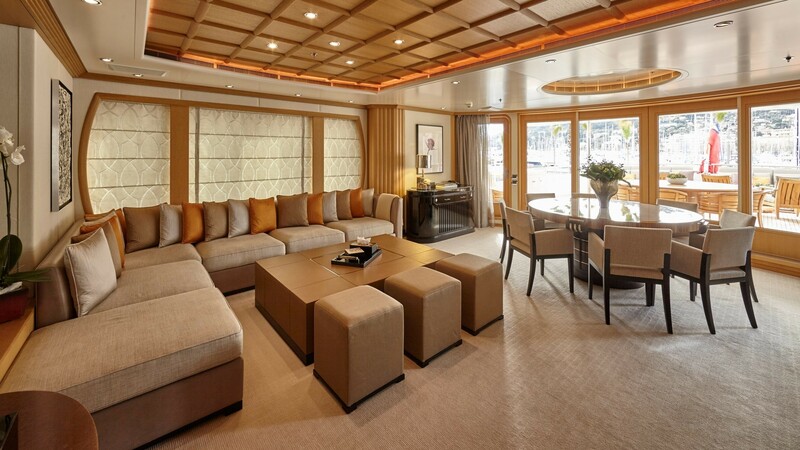 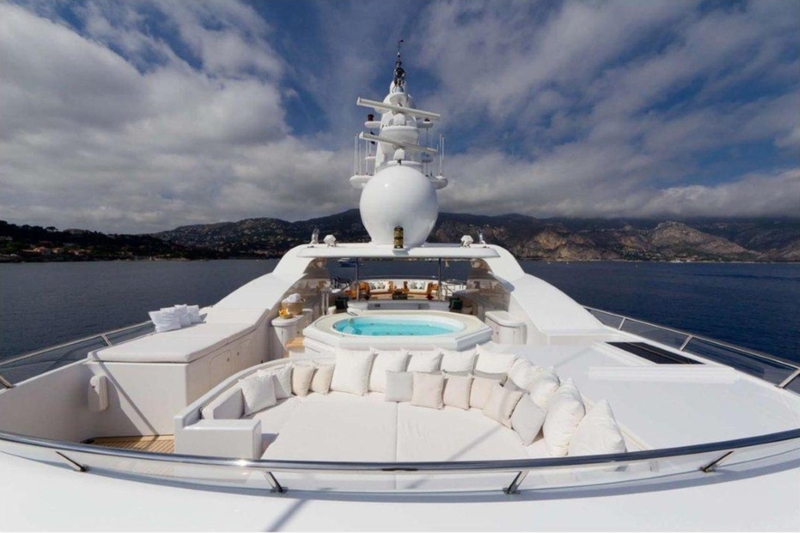 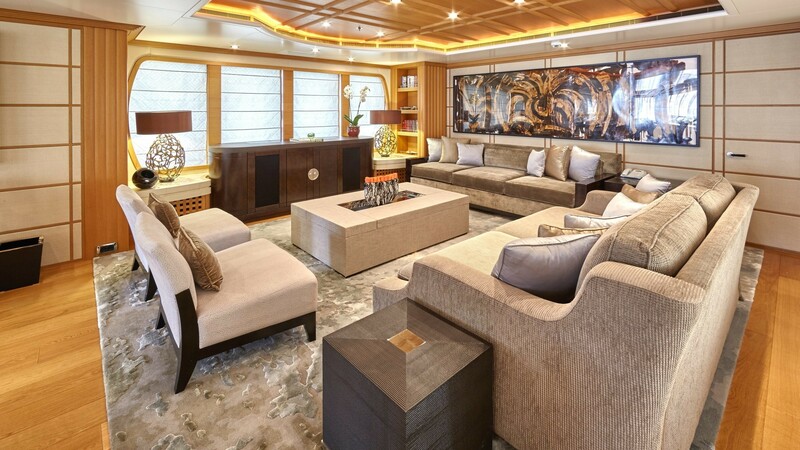 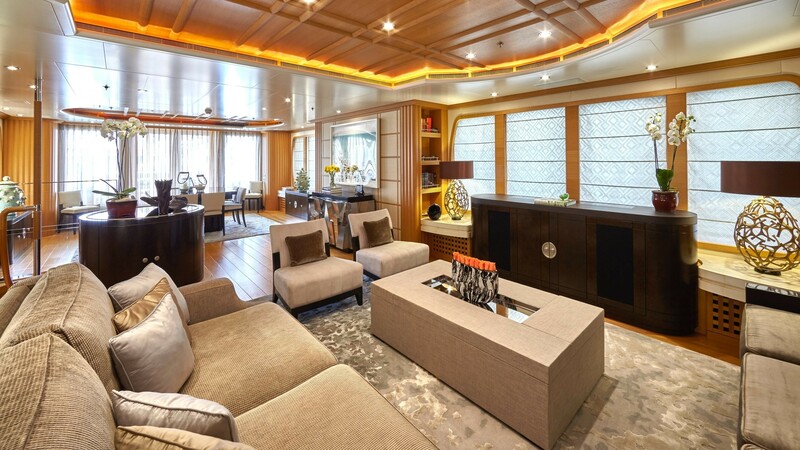 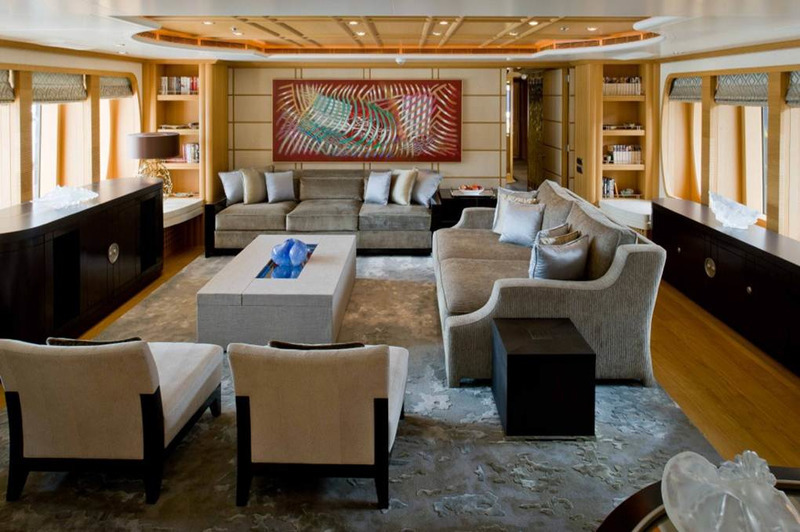 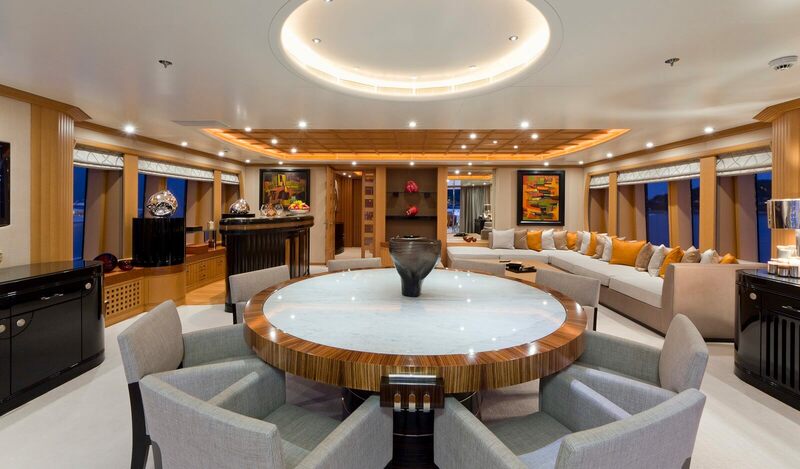 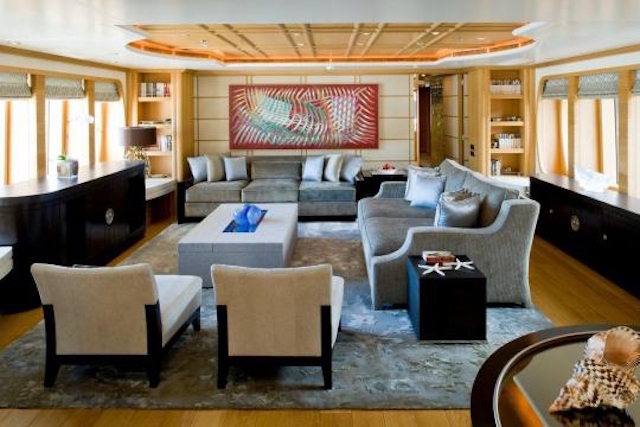 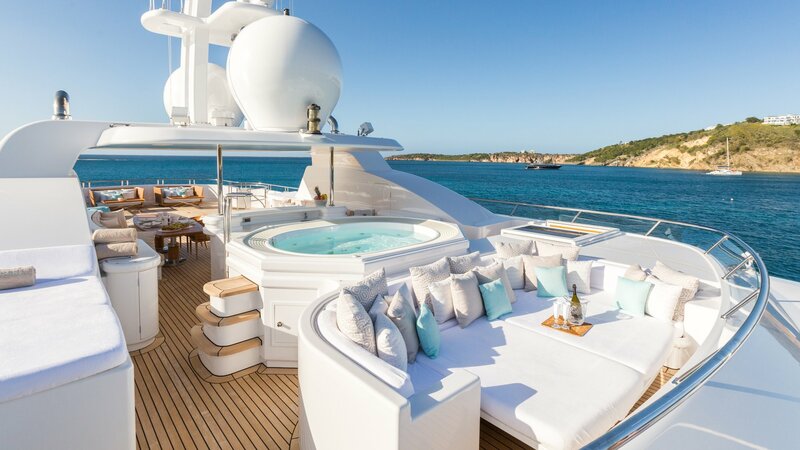 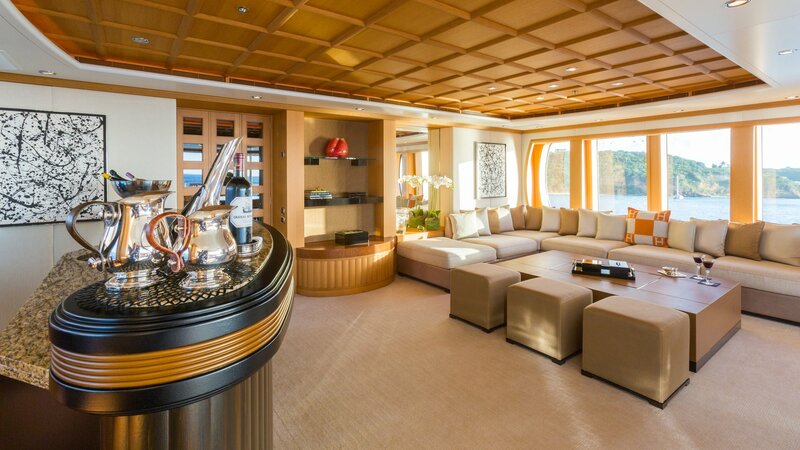 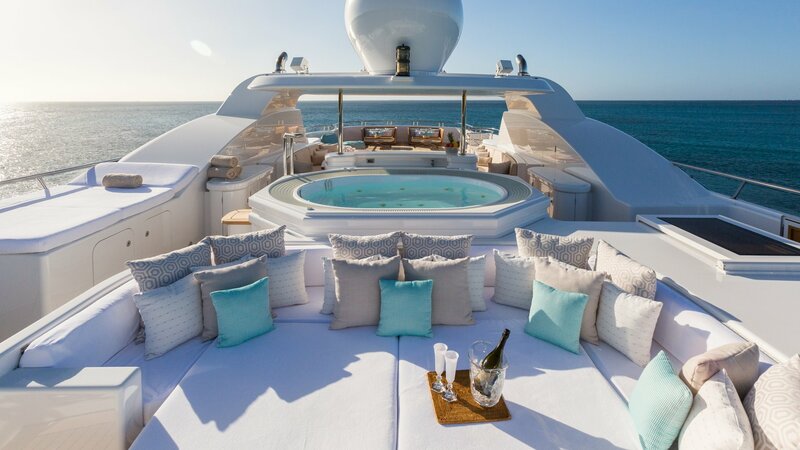 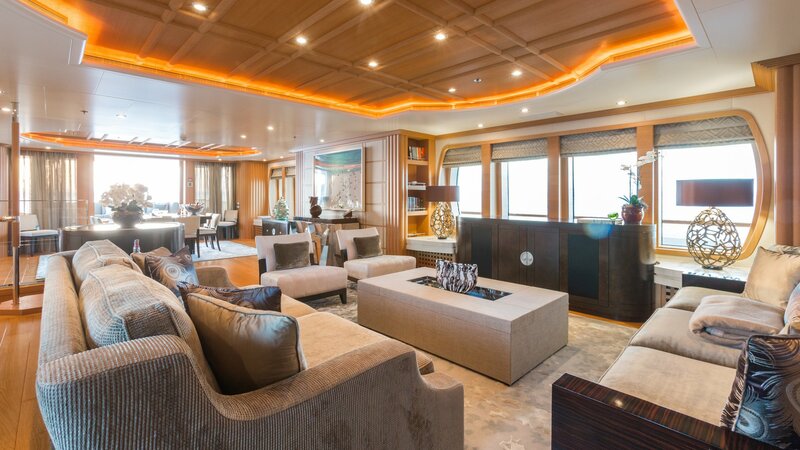 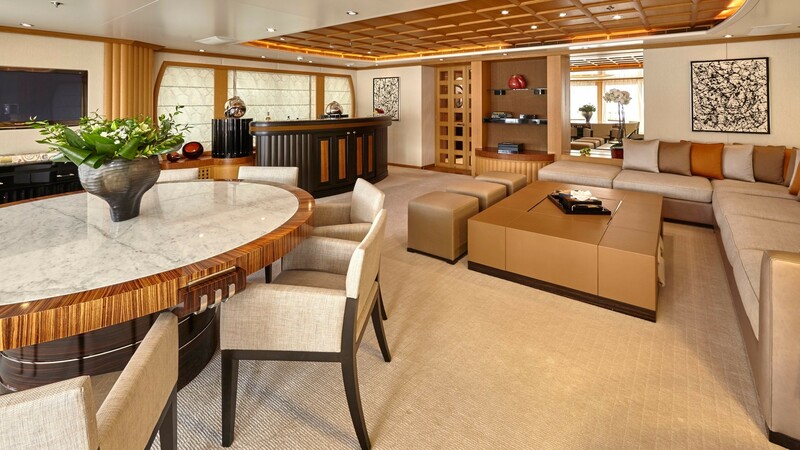 The luxury yacht’s spacious living areas include a main salon offering a comfortable TV area with a curved couch, flat screen TV and digital surround sound. 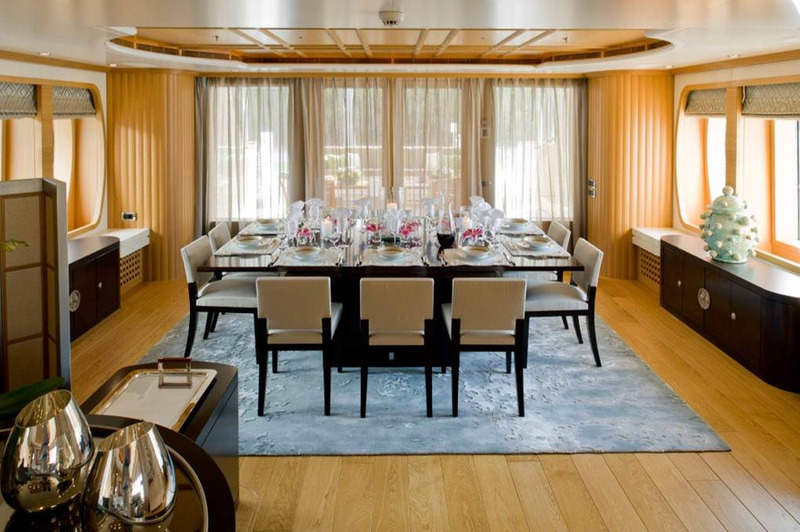 There is dining for 12 guests to the aft of the salon which is paneled in rich oak and decorated with subtle cream fabrics. 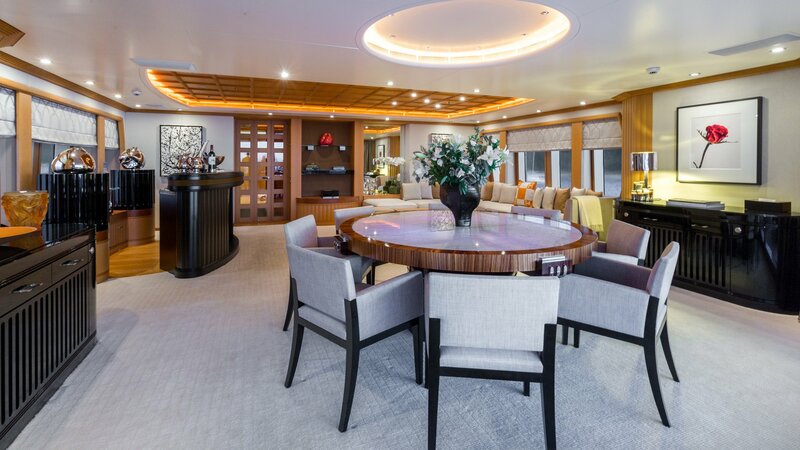 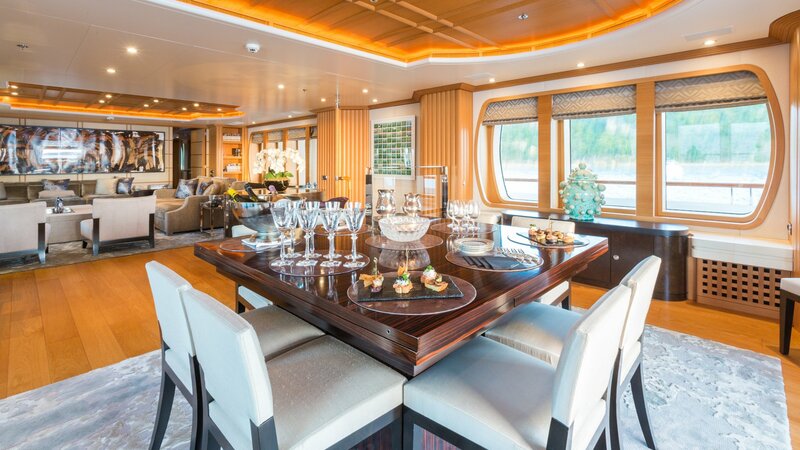 Her full-width upper bridge deck saloon offers a bar and very comfortable couches, two flat screen TVs and dining for 12 guests inside. 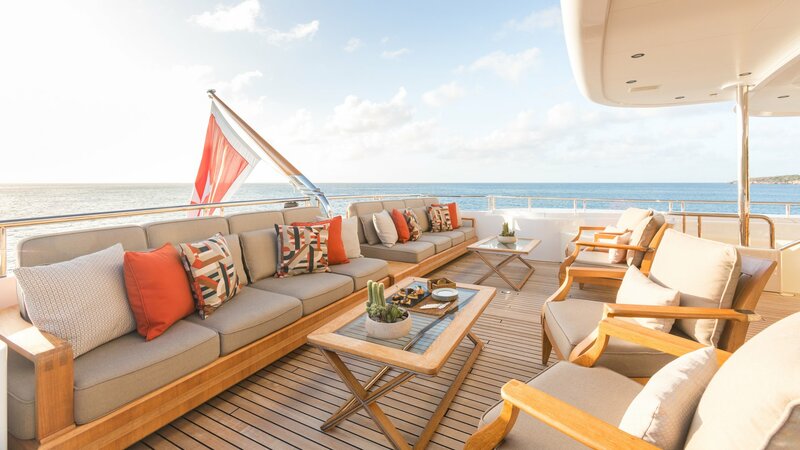 This area leads onto a large alfresco dining area with additional comfortable seating for 12 guests, while the much bigger sun deck is ideal for entertaining, with its bar, barbecue, Spa Pool, outdoor TV and seating for up to 20 guests! 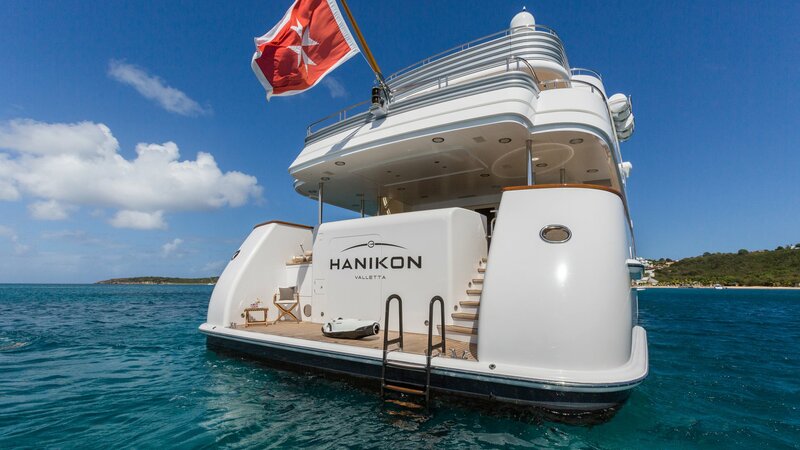 HANIKON yacht also has a sun area on the top deck in which the sun beds can convert to a cocktail or dining area by way of a high or low table that is concealed under the mattresses. 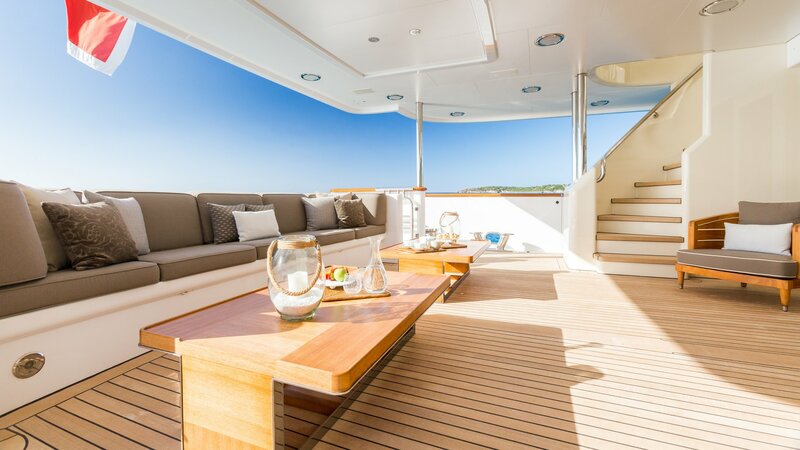 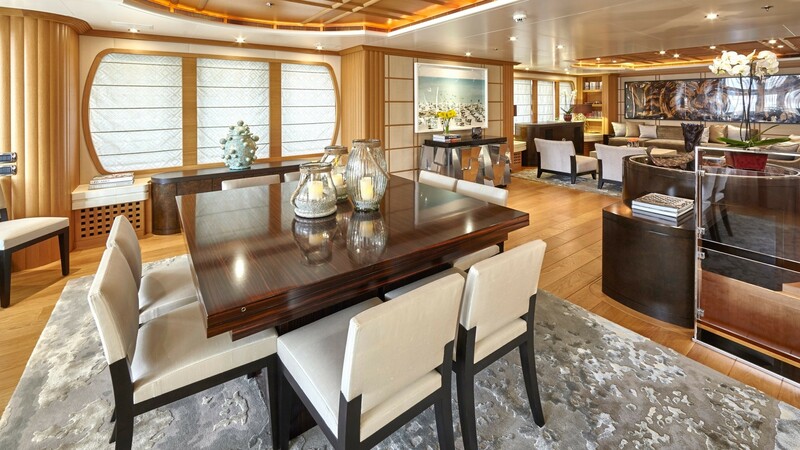 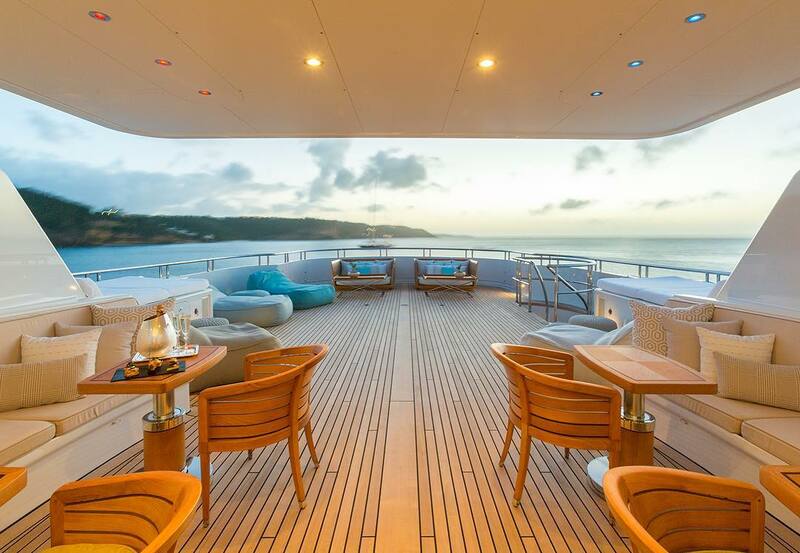 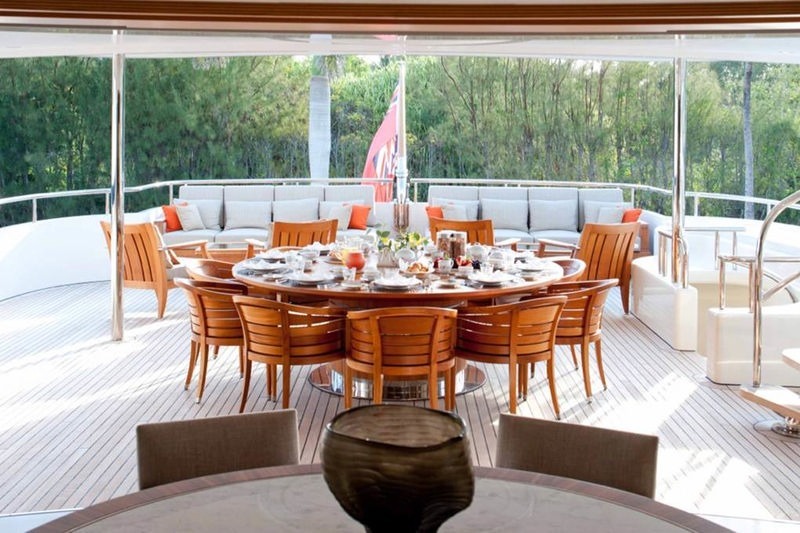 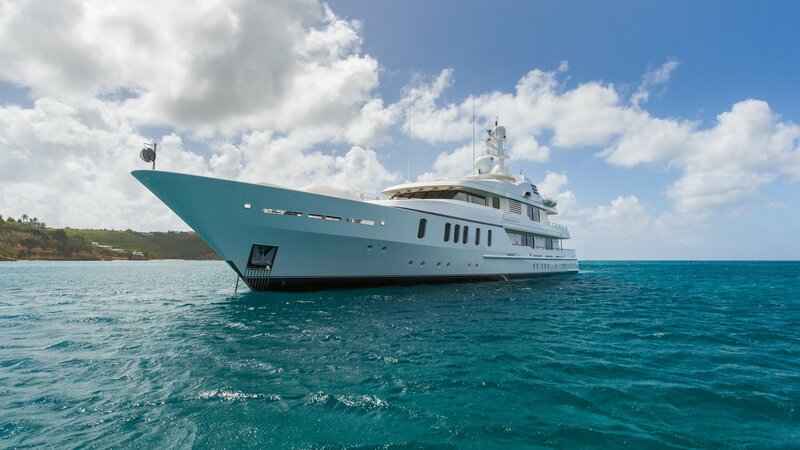 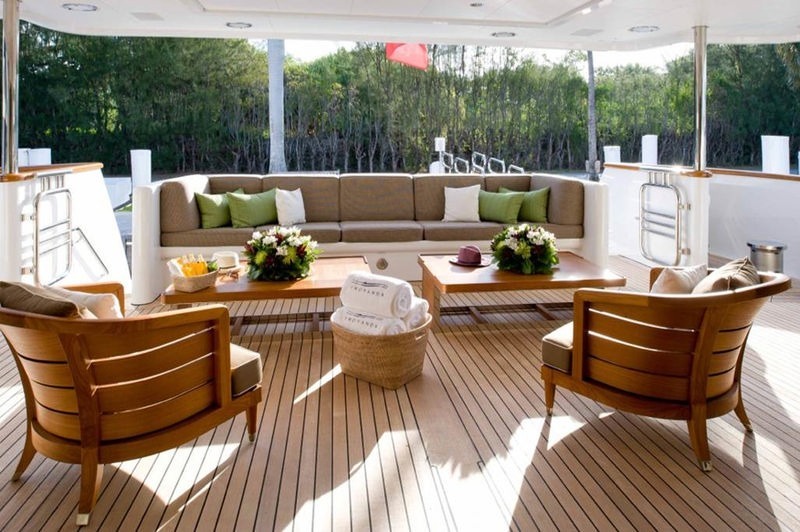 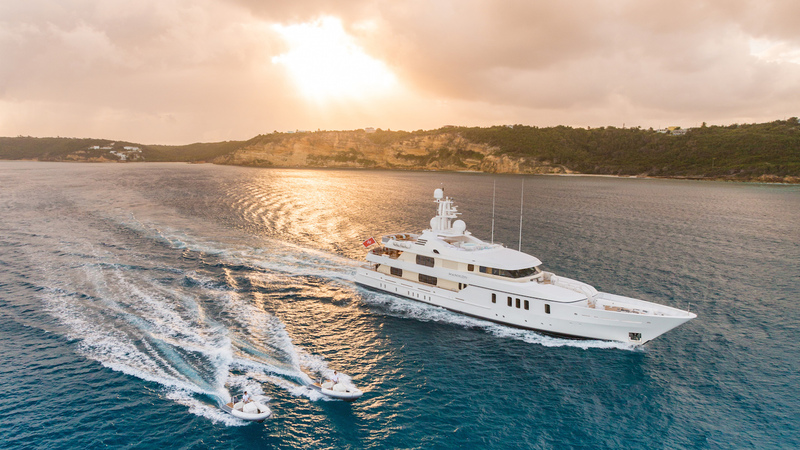 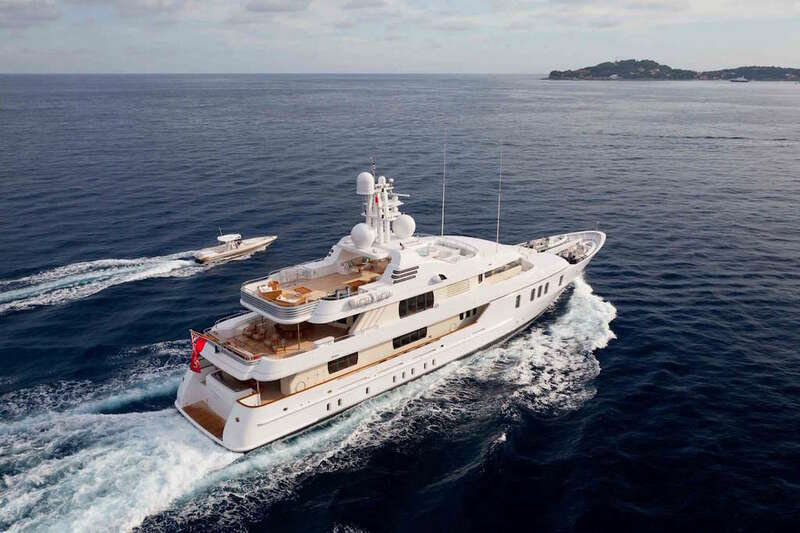 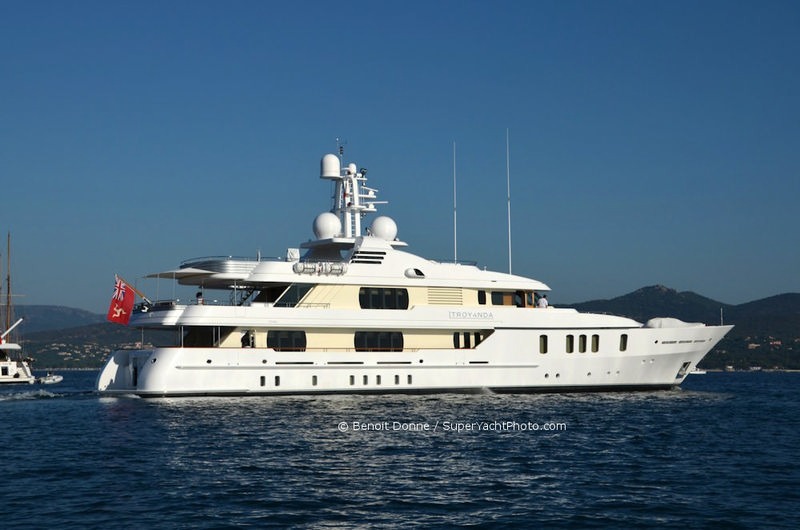 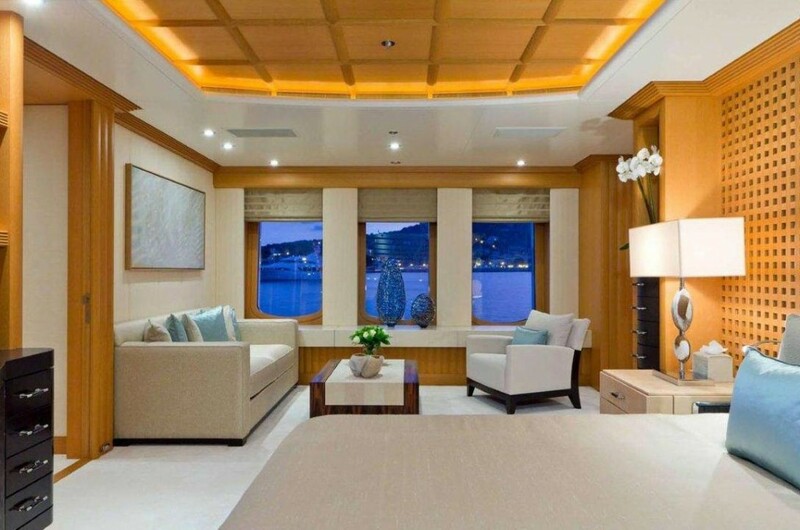 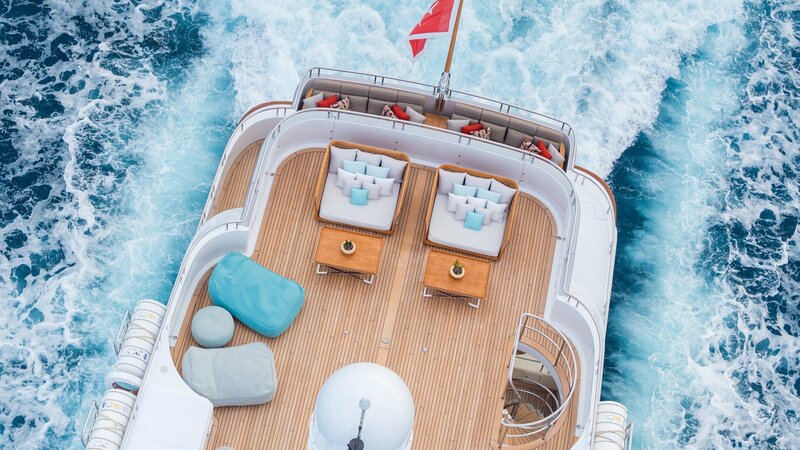 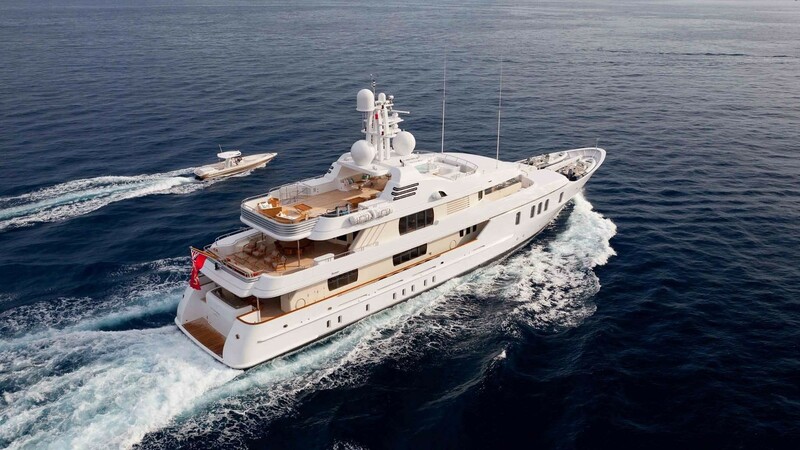 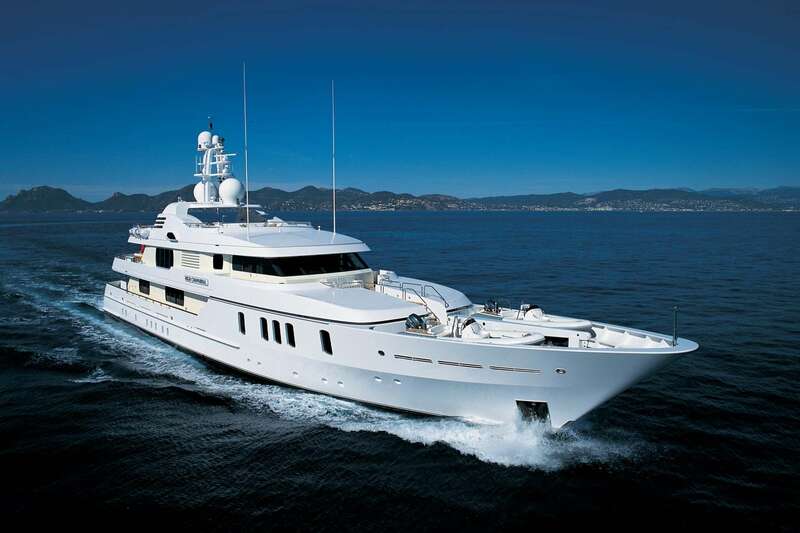 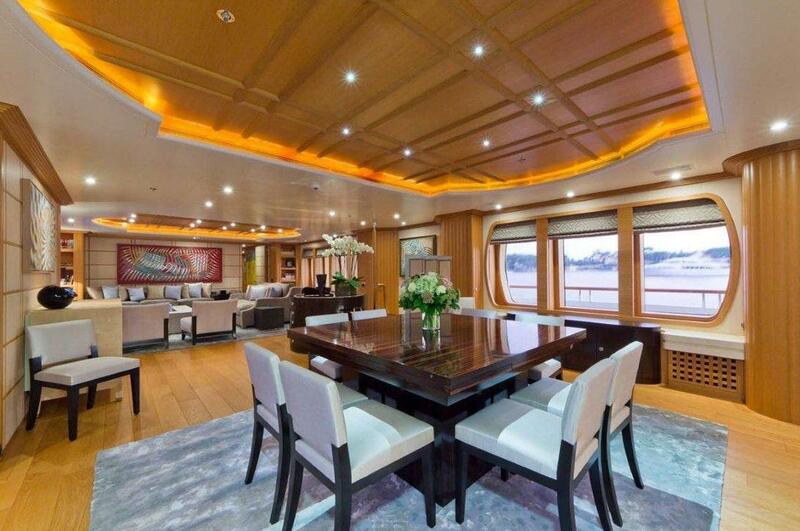 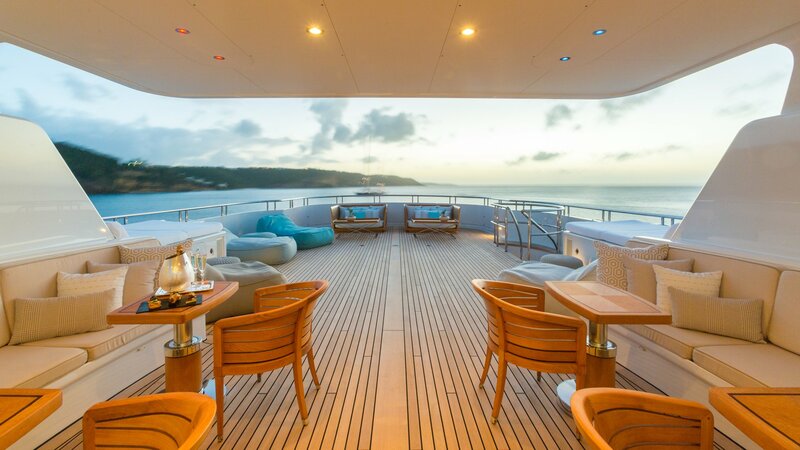 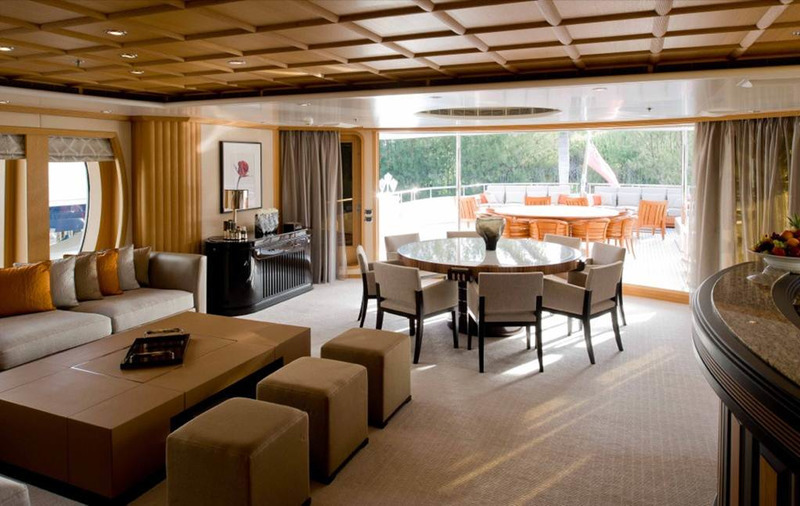 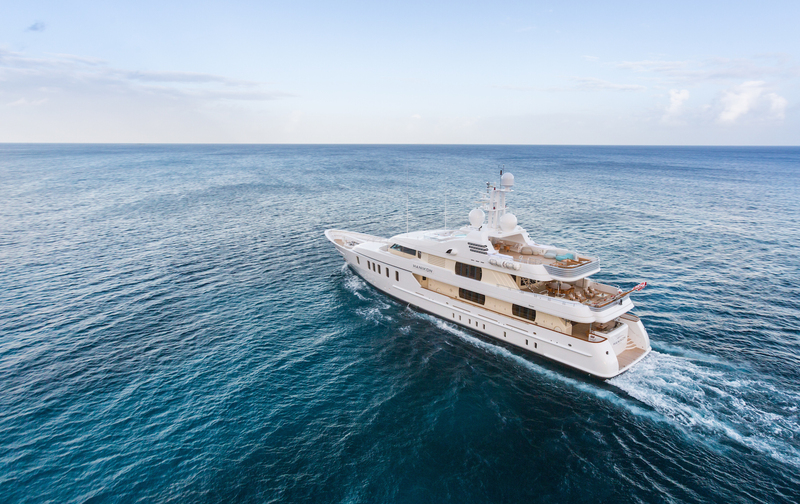 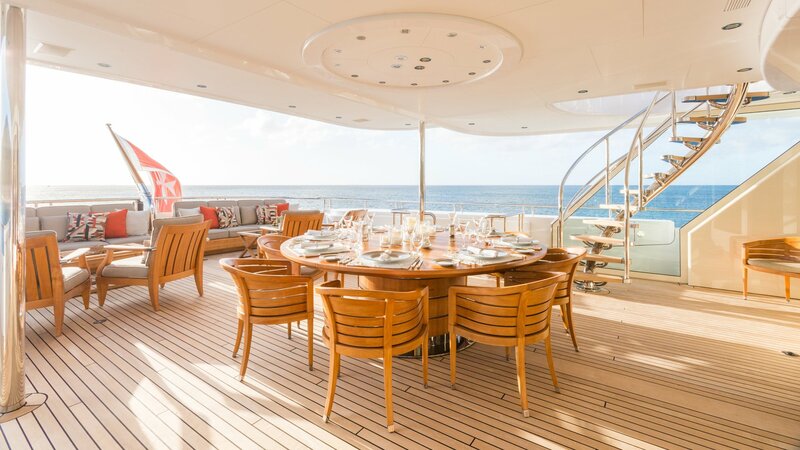 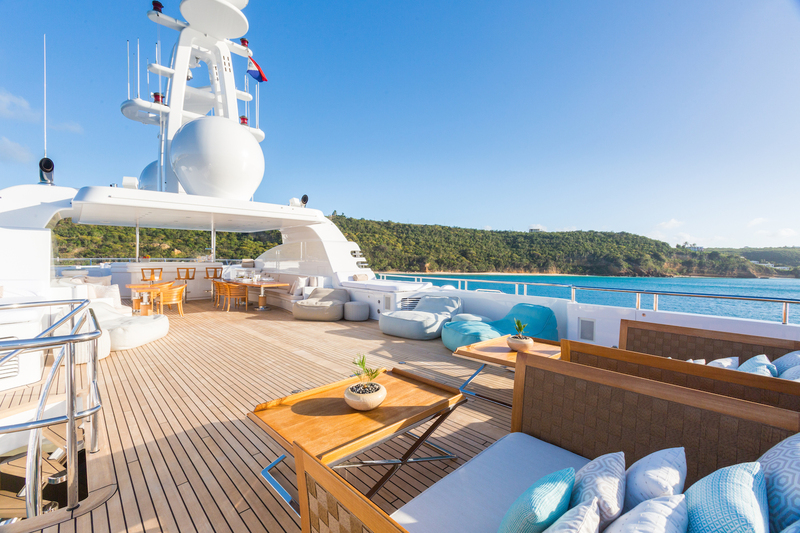 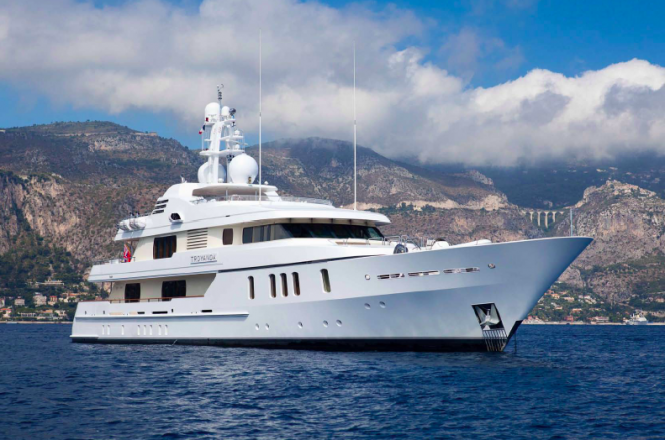 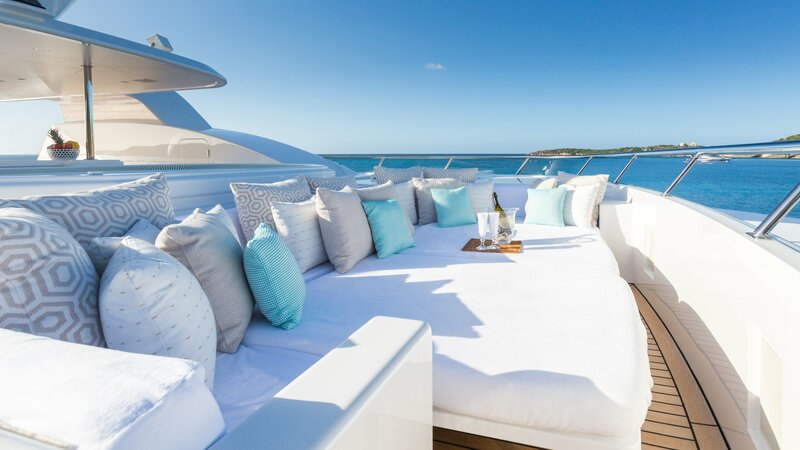 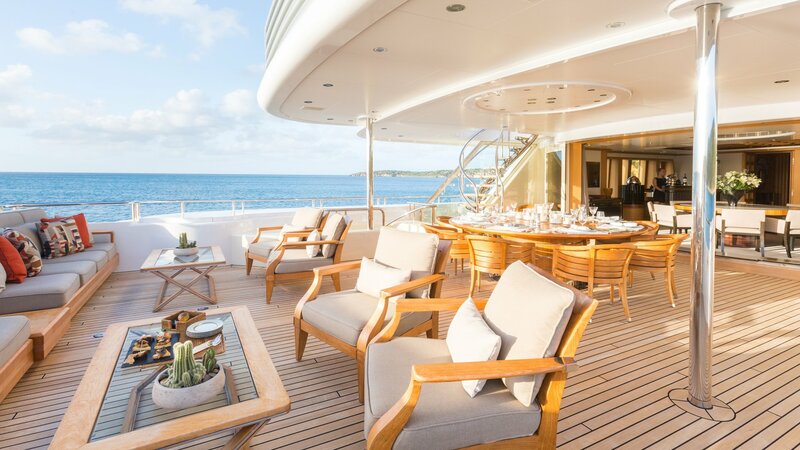 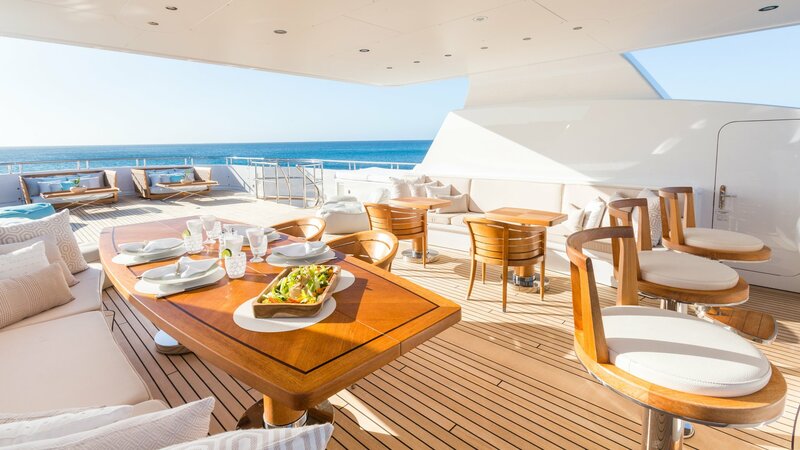 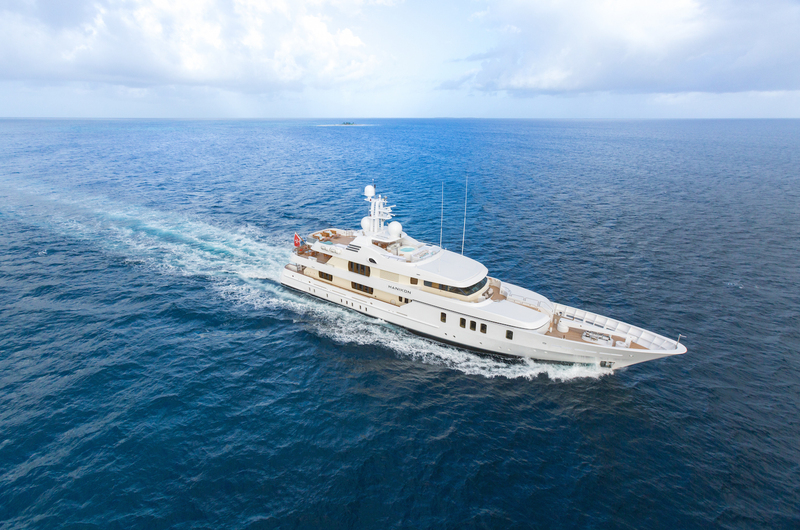 She received a 2010-2011 refit which included the addition of new carpets, interior furniture, roman style blinds, exterior dining tables and teak furniture, cushions, sunbeds, etc. 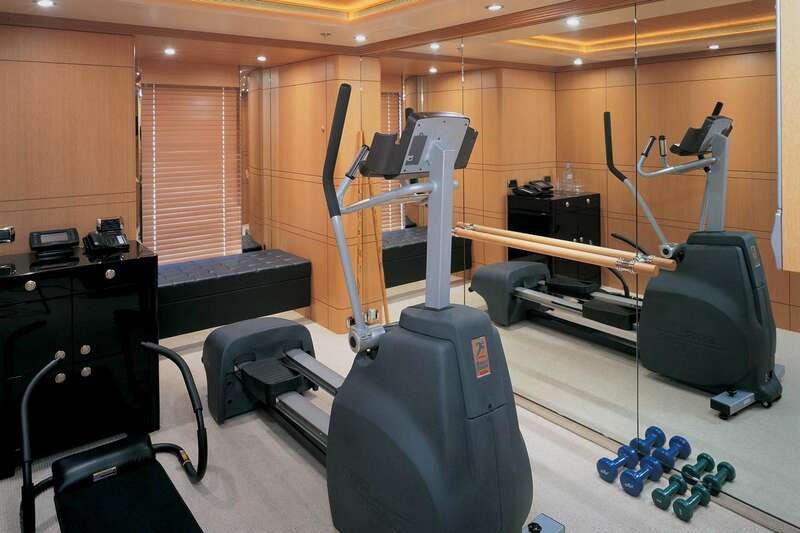 New treadmills were also fitted on the sundeck, and the Gym now functions more as a 6th cabin. 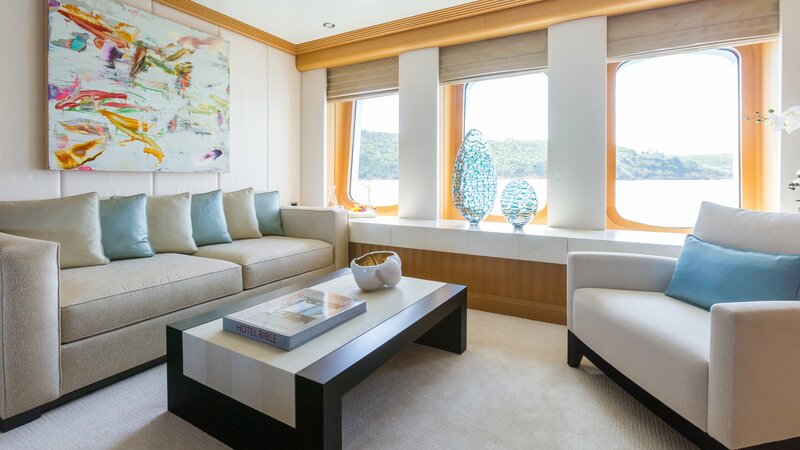 2 new Seatel TV systems for Sky TV, New HD TV’s throughout (3D in some areas), BlueRay players in all cabins, Central Kaleidescape with 900 DVD library. 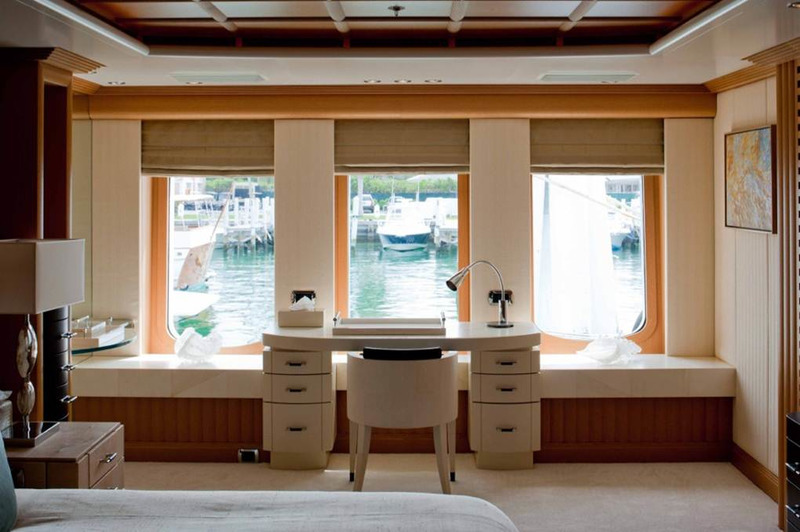 New exterior TV’s for Bridge Deck and SunDeck New Crestron Remotes throughout the upgraded audio system, new speakers etc. 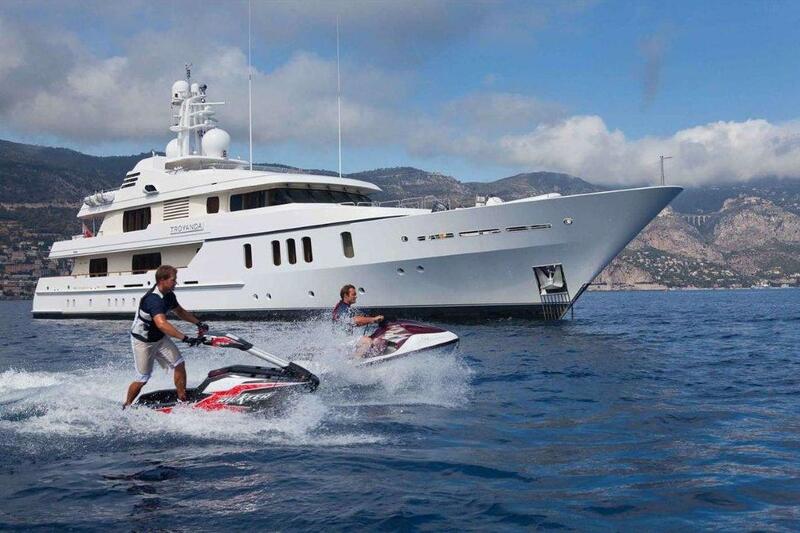 There are also 2 new Richter stand up jet skis, 2 new Seabob water toys, and a new Novurania Chase 38ft tender. 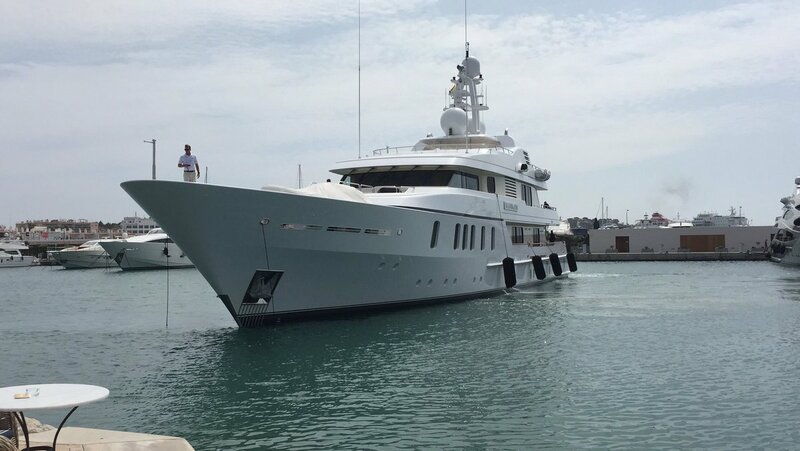 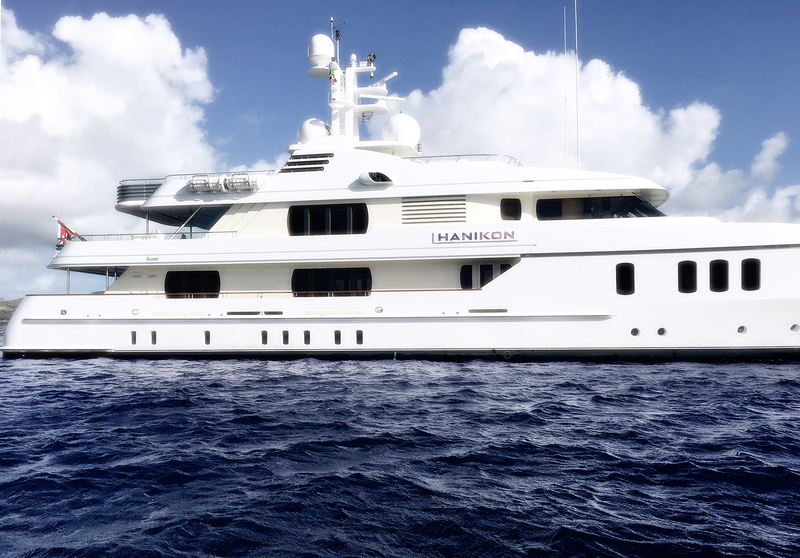 In 2016 this stunning yacht received another refit. 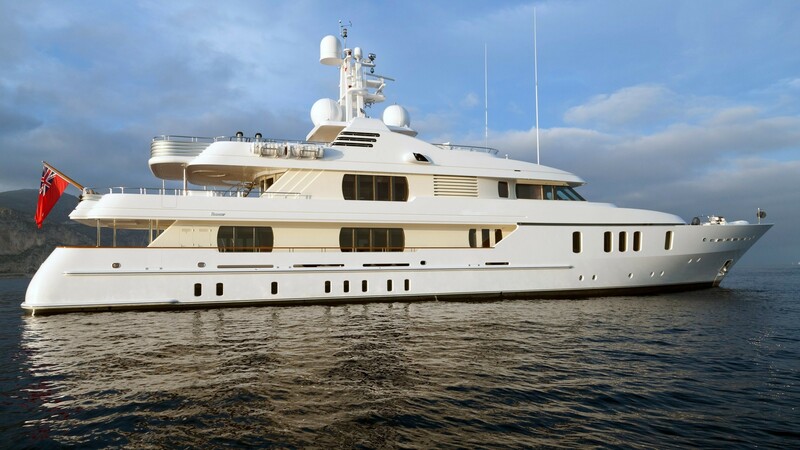 She is now looking amazing and ready to take her guests on a luxury charter vacation. 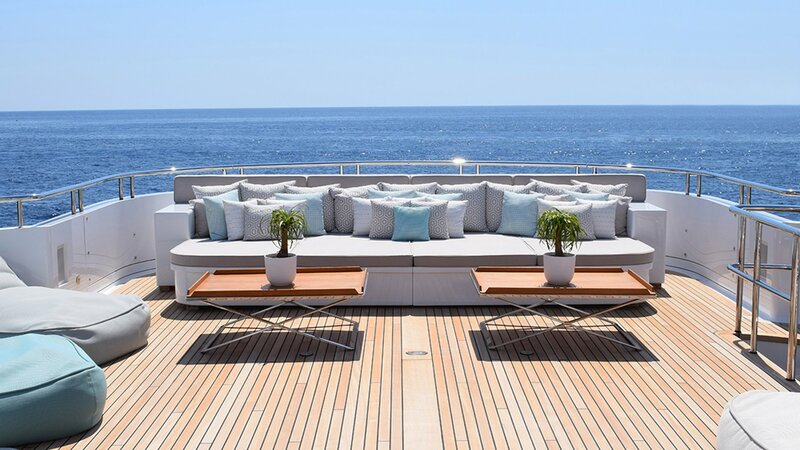 The refit included new carpets, new interior furniture, New roman style blinds, New exterior dining tables and teak furniture, cushions, sunbeds, etc. 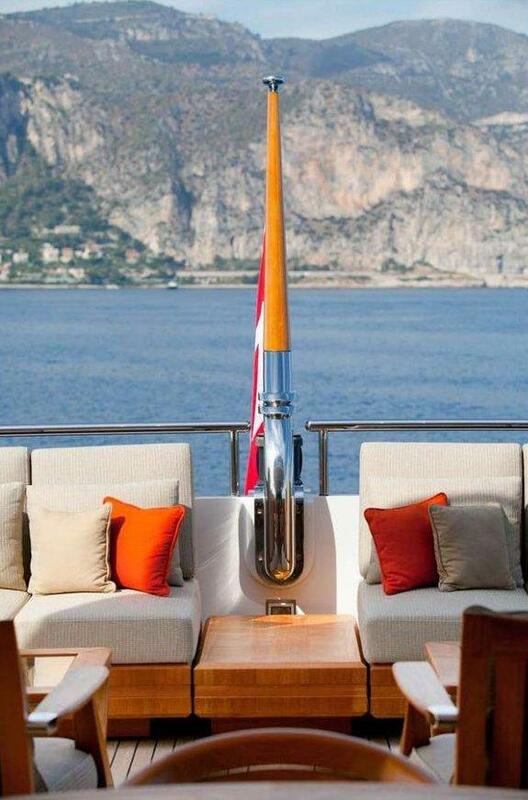 New treadmills fitted on the sundeck. 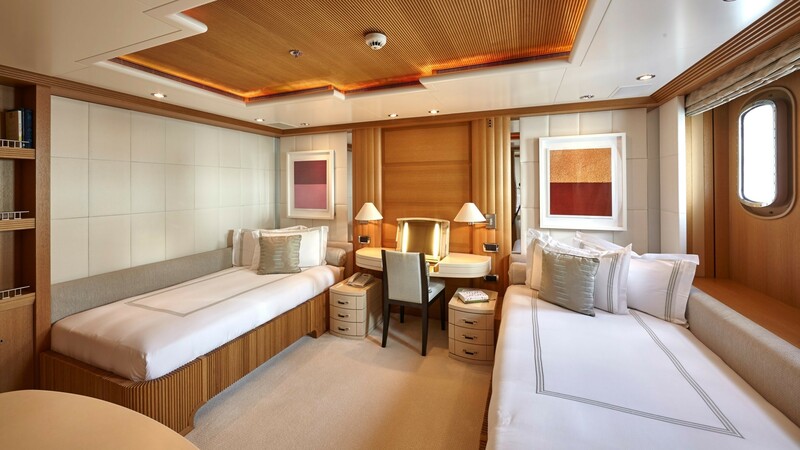 Masseuses room on main deck with two Pullmans. 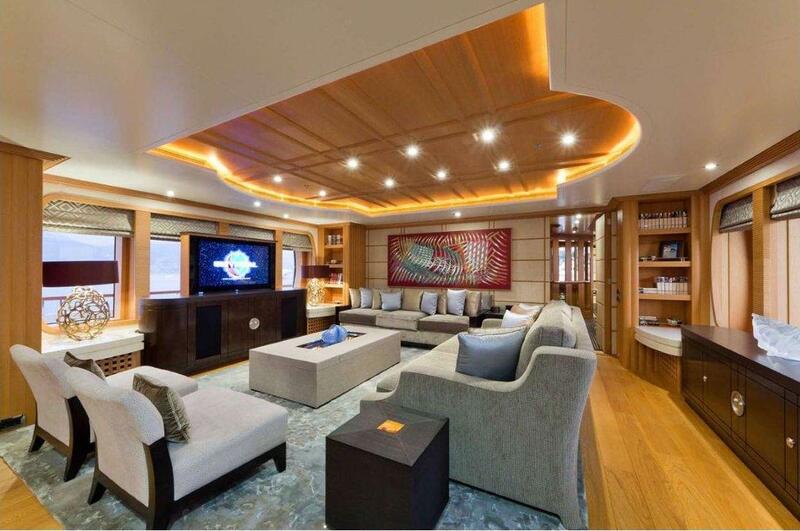 2 new Seatel TV systems for Sky TV New HD TV’s throughout (3D in Bridge salon, main salon and Master) BlueRay players in all cabins Central Kaleidescape with 900 DVD library New exterior TV’s for B/Deck and SunDeck New Crestron Remotes throughout Upgraded audio system, new speakers etc, 2 new Seabob water toys, New Novurania Chase 38ft tender (Available through separate negotiation). 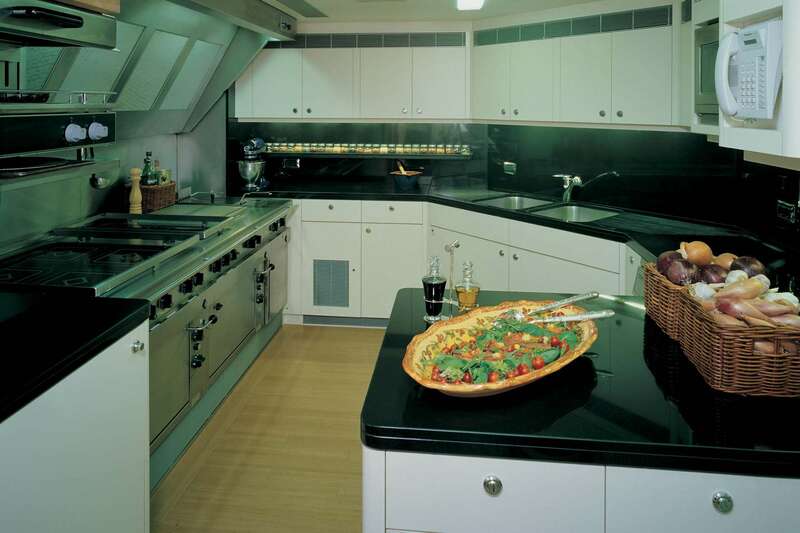 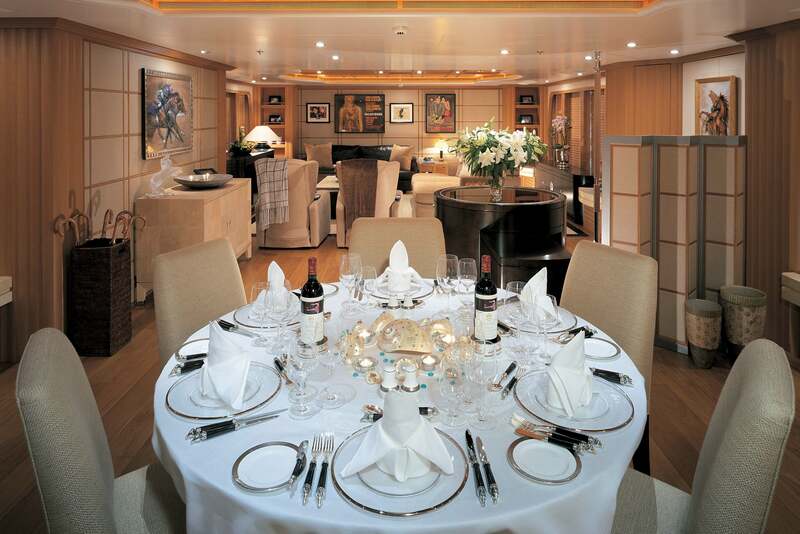 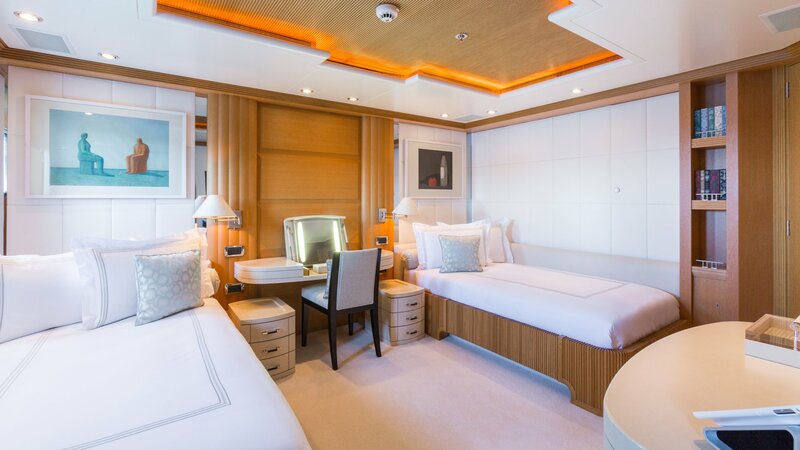 Guest accommodation is comprised of 6 cabins which are able to accommodate up to 12 guests on board. 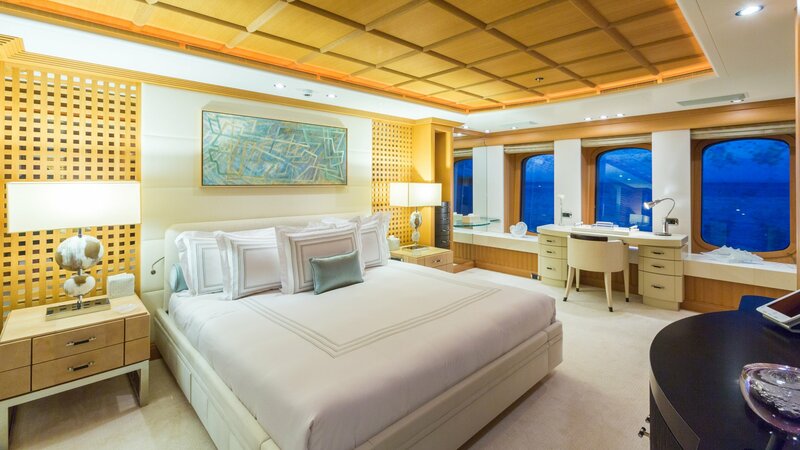 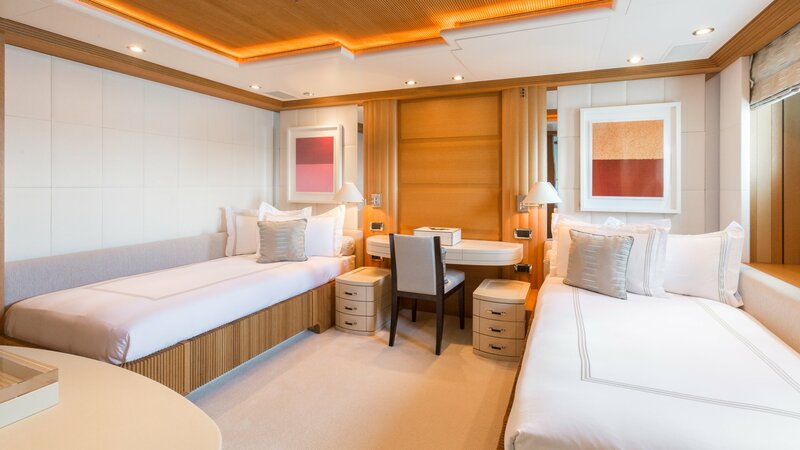 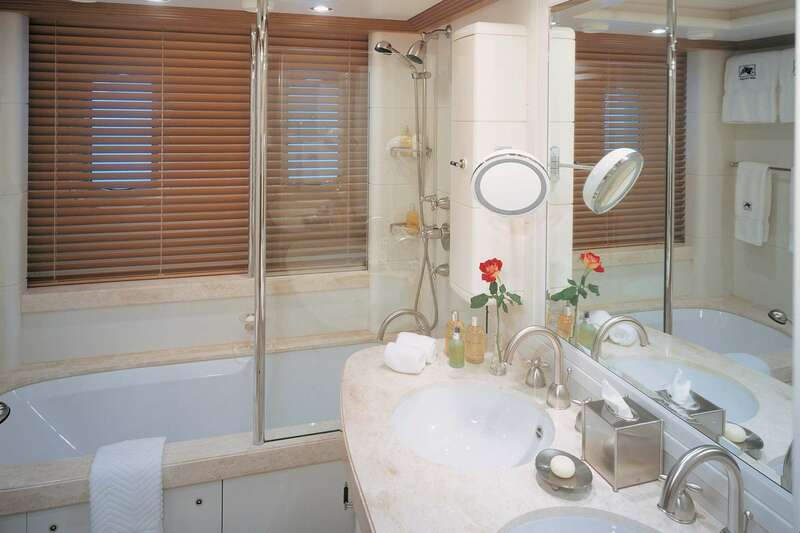 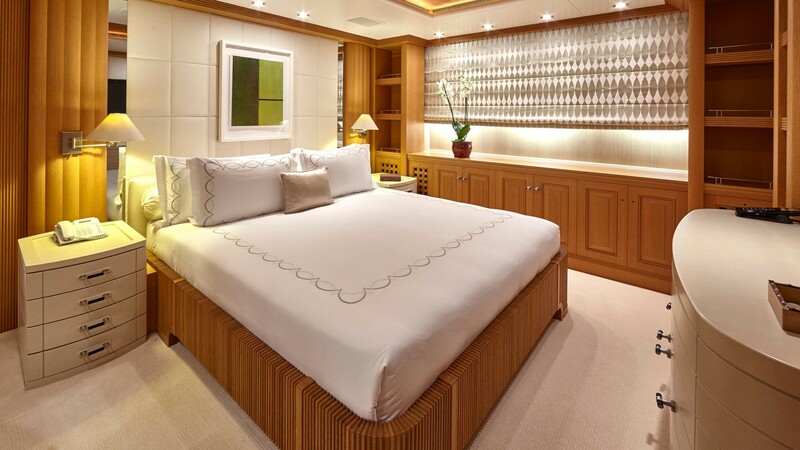 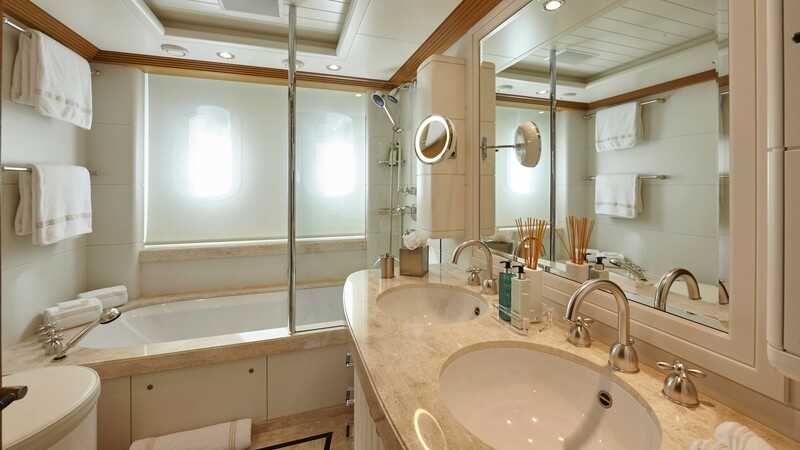 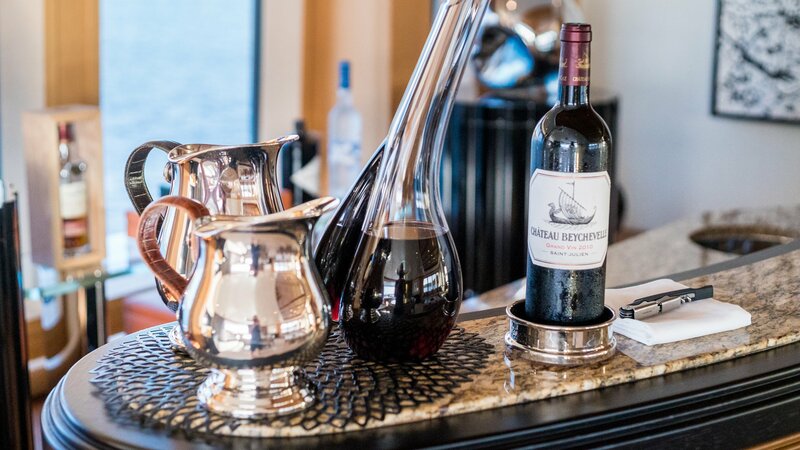 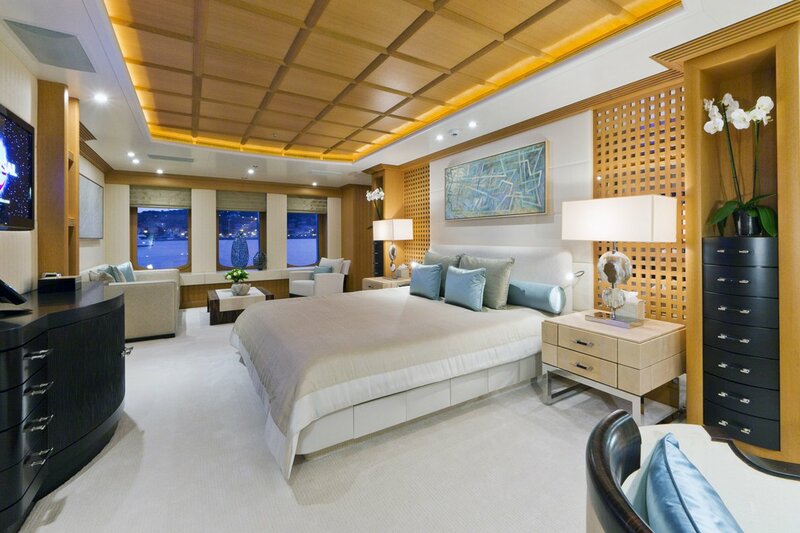 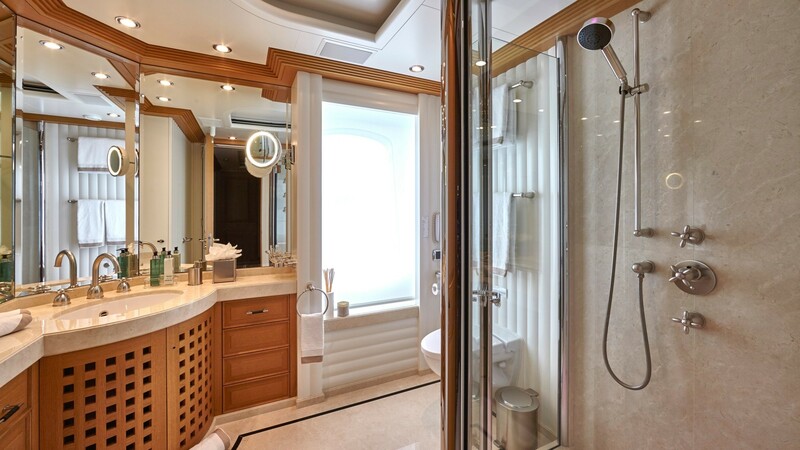 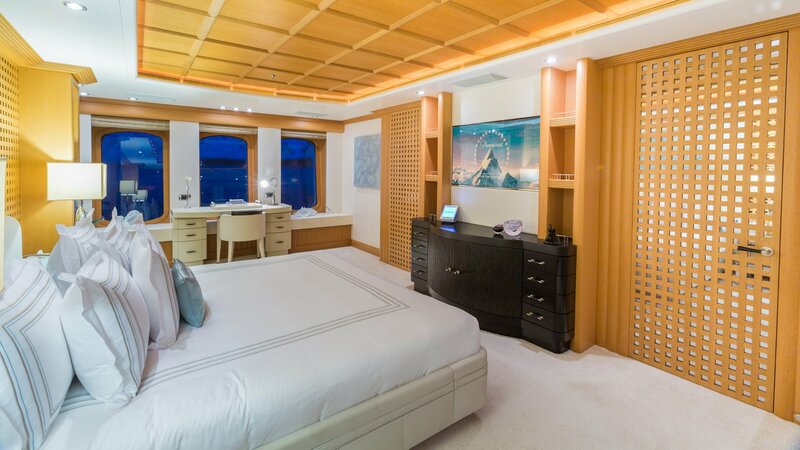 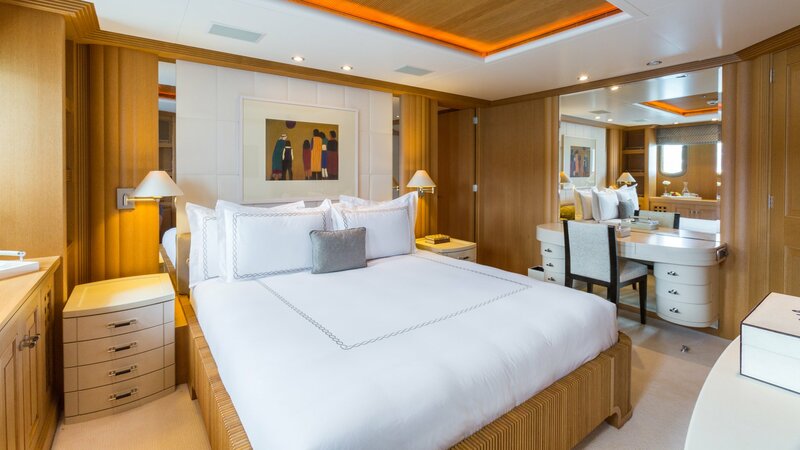 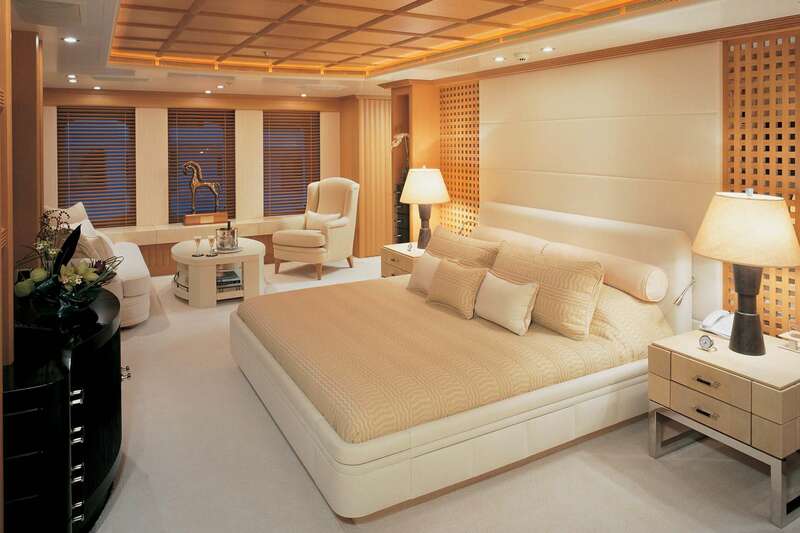 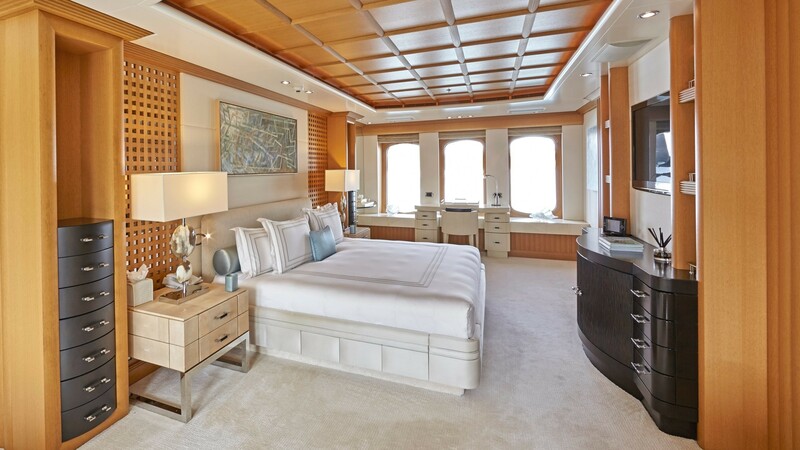 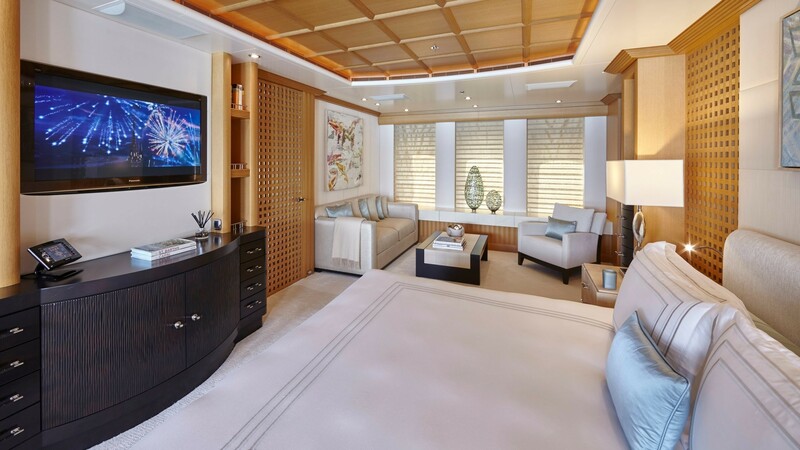 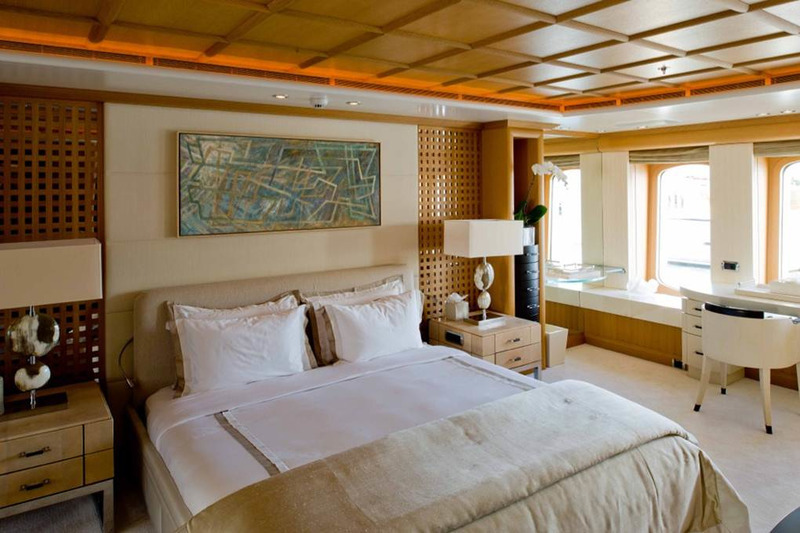 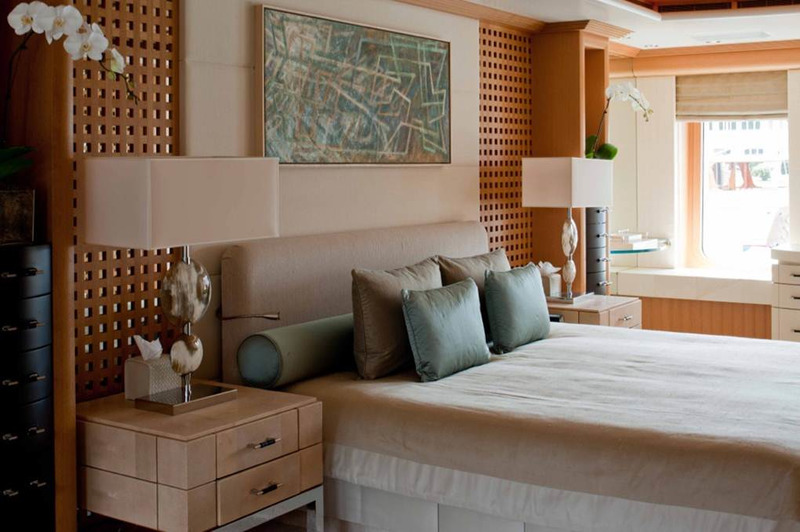 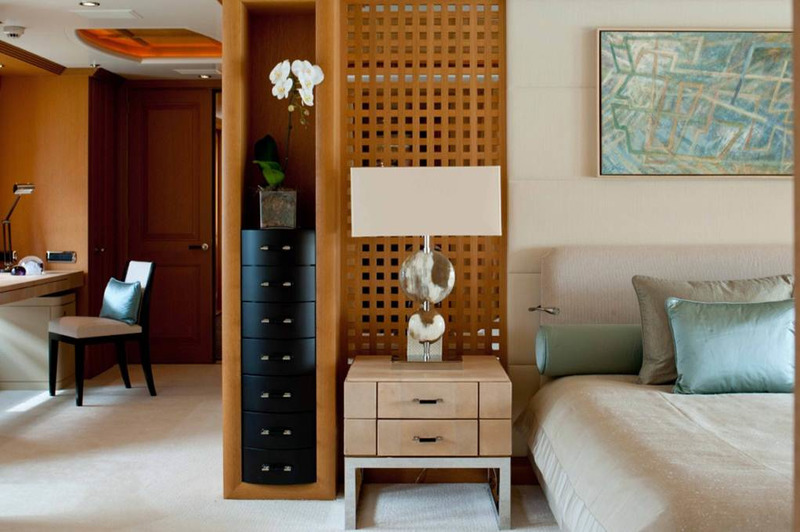 Her full-width master stateroom is on the main deck and boasts a lounge and study as well as "his and her" bathrooms and a dressing room. 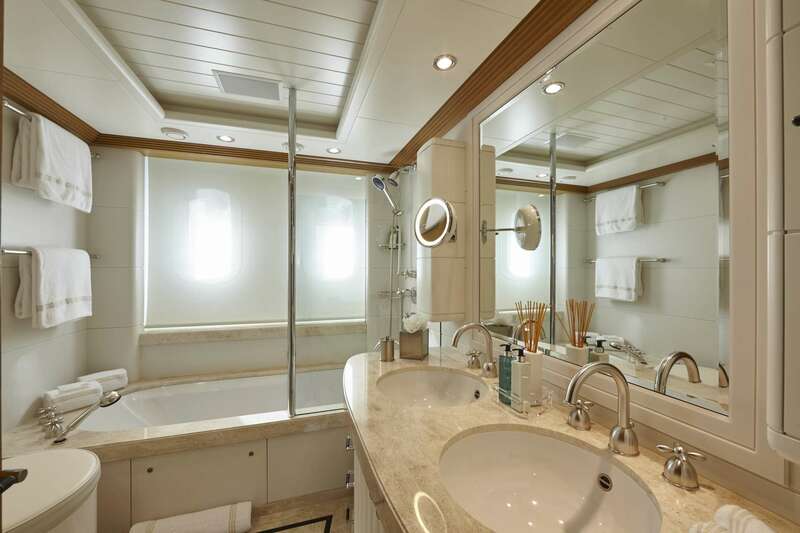 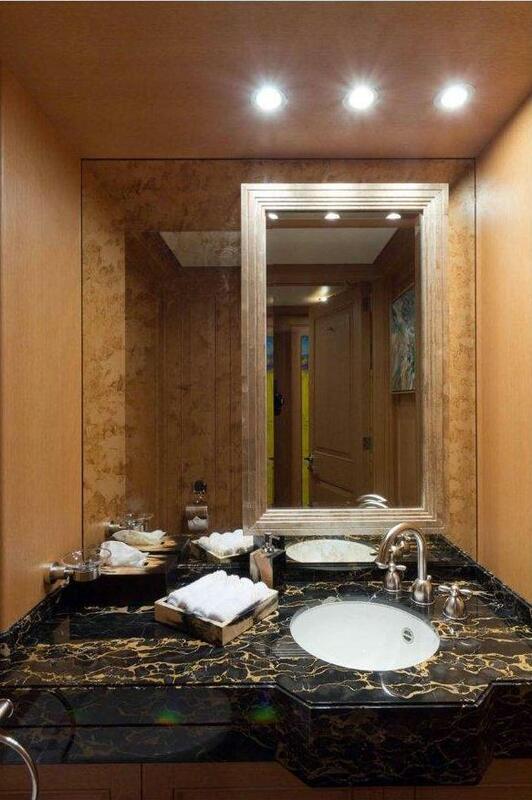 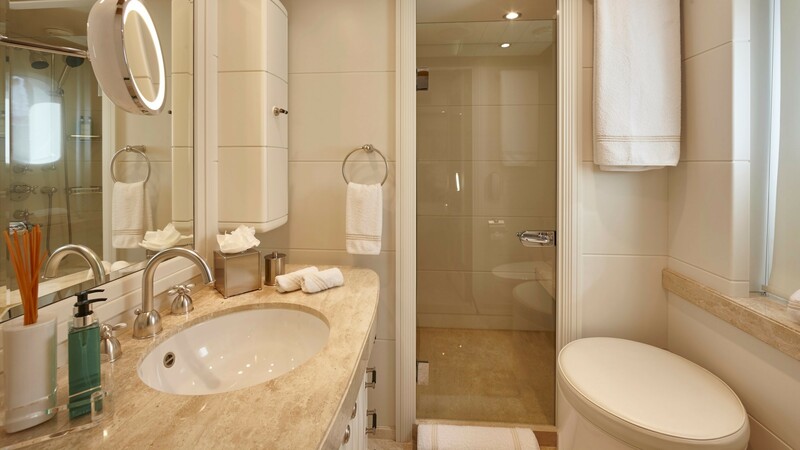 She also has two large double cabins with dressing rooms and two twin cabins all with ensuite bathroom facilities. 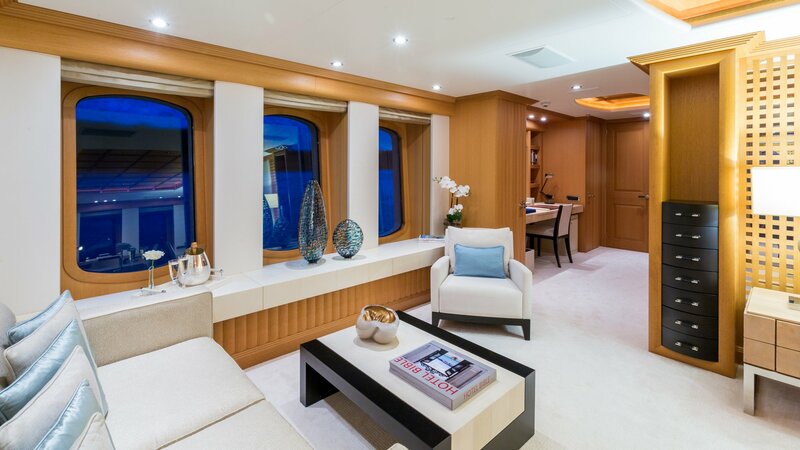 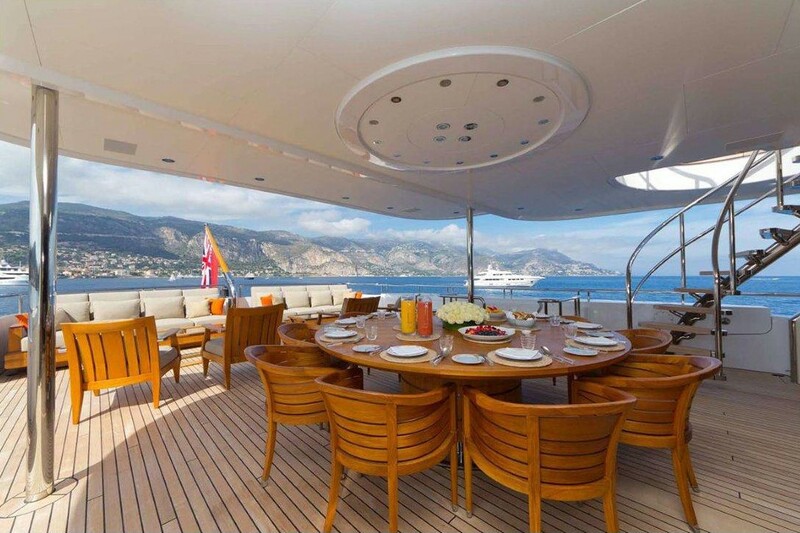 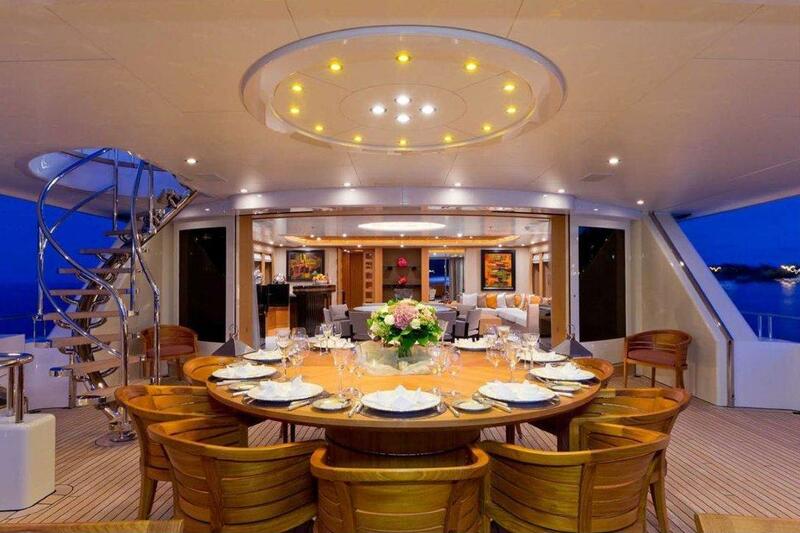 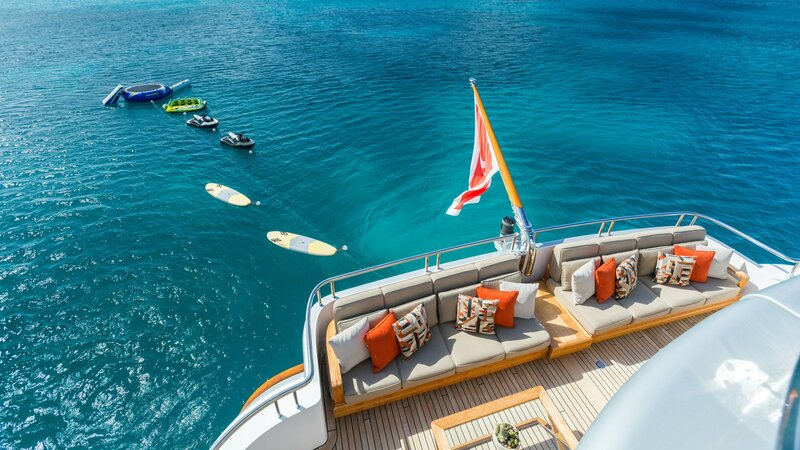 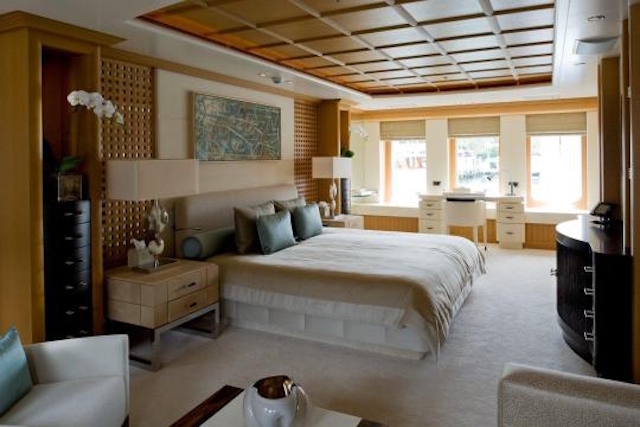 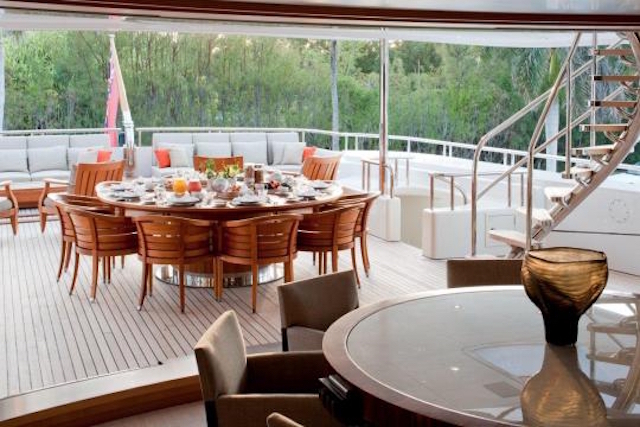 Although the yacht can only sleep 10 guests, the gymnasium can also be used as a cabin. 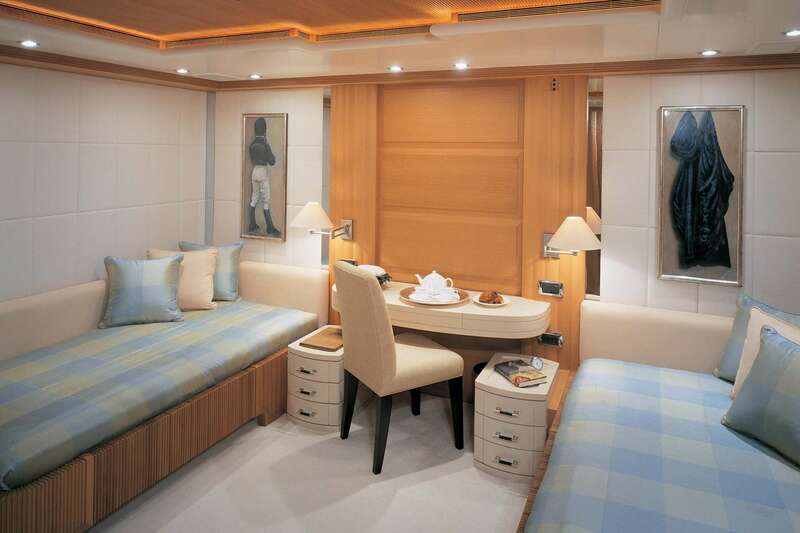 It has two Pullman beds which are ideal for security staff, nannies or could also be used for children. 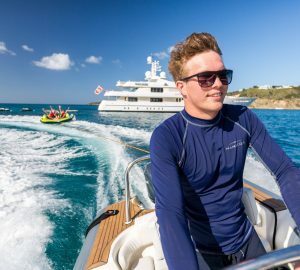 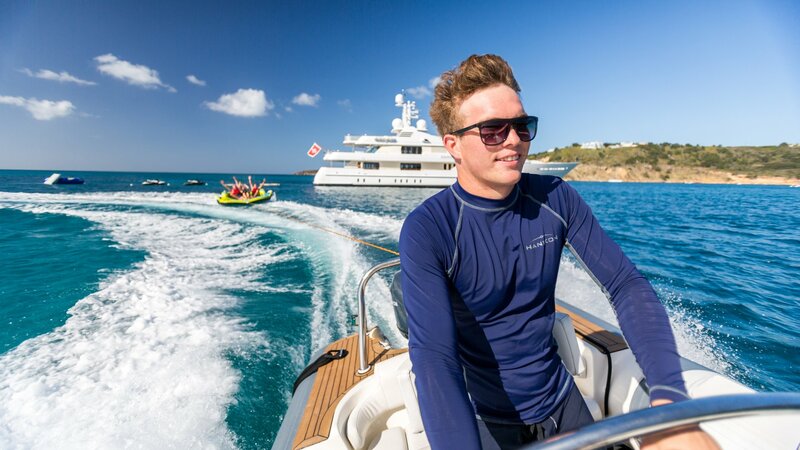 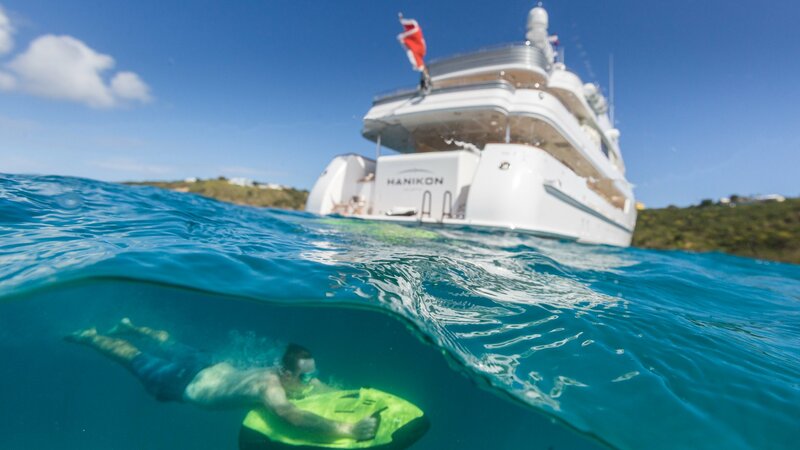 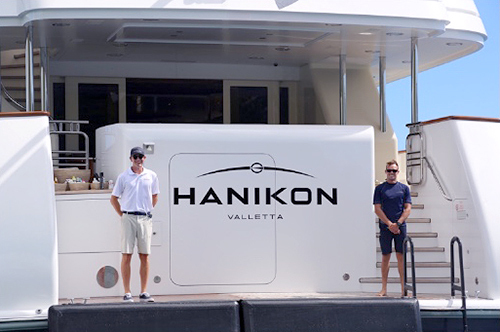 Luxury motor yacht HANIKON has the following amenities: Her tenders and boats include 2 Ribtec Riviera 620 SX custom built tenders with quiet 4 stroke Yamaha 115hp outboards and 2 Yamaha 800R wave riders. 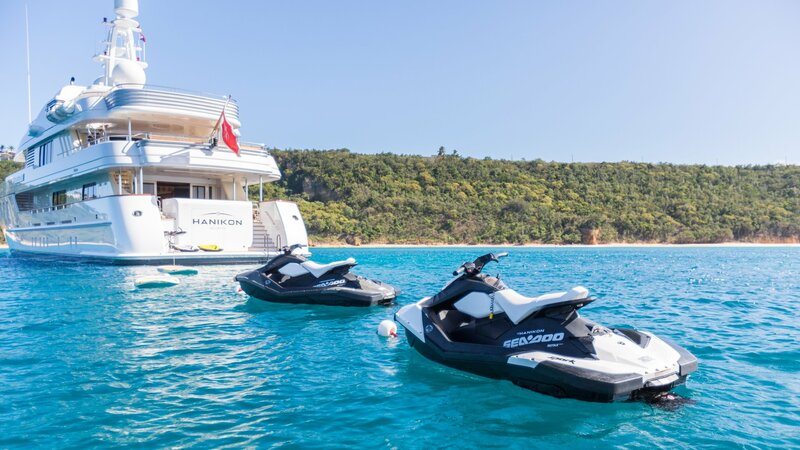 She also has snorkeling equipment and a large selection of towable toys, water skis, wake boards and windsurfers. 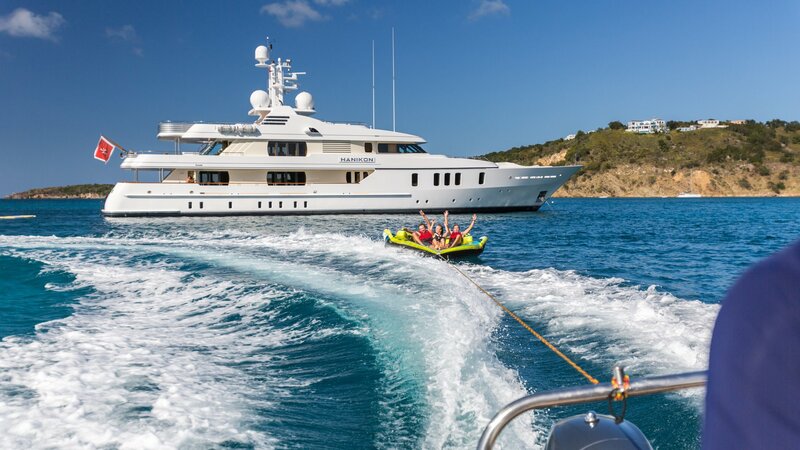 In addition, this superb yacht has a mini gymnasium, equipped with a non-impact treadmill, weights, weight bench and abdominal crunch machine. 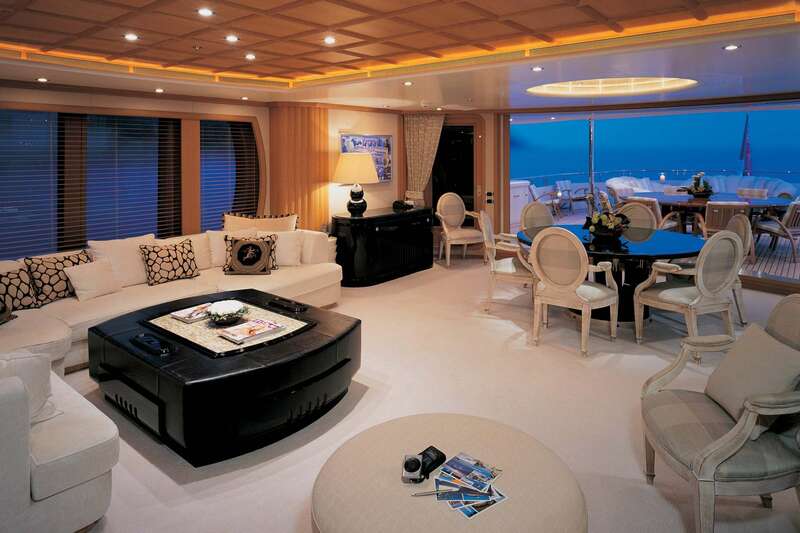 Audio Visual Equipment and Deck Facilities are also top of the line and include both SKY and Direct Television. 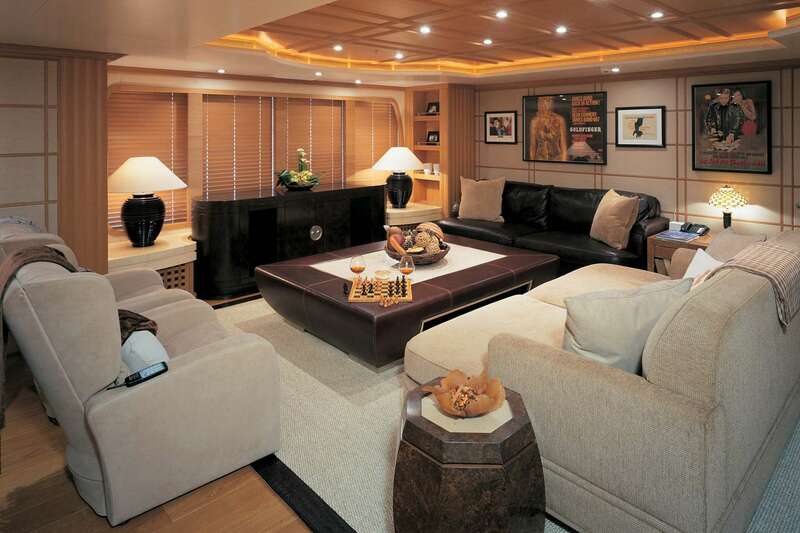 She has flat screen TV's throughout and Crestron control units. 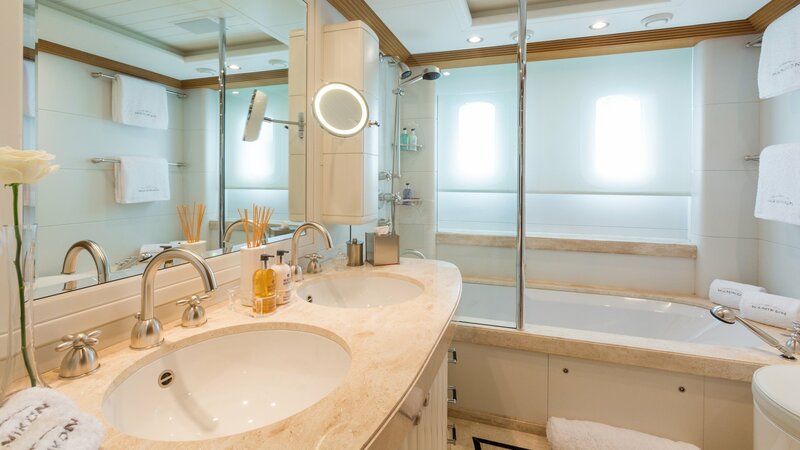 She has U.S.A power sockets located conveniently throughout. 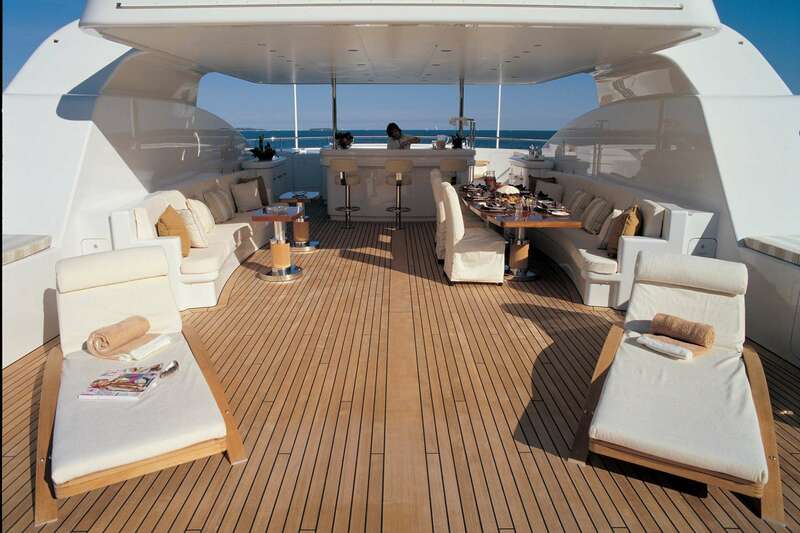 The yachts communications include F-55 Satcom phone and fax. 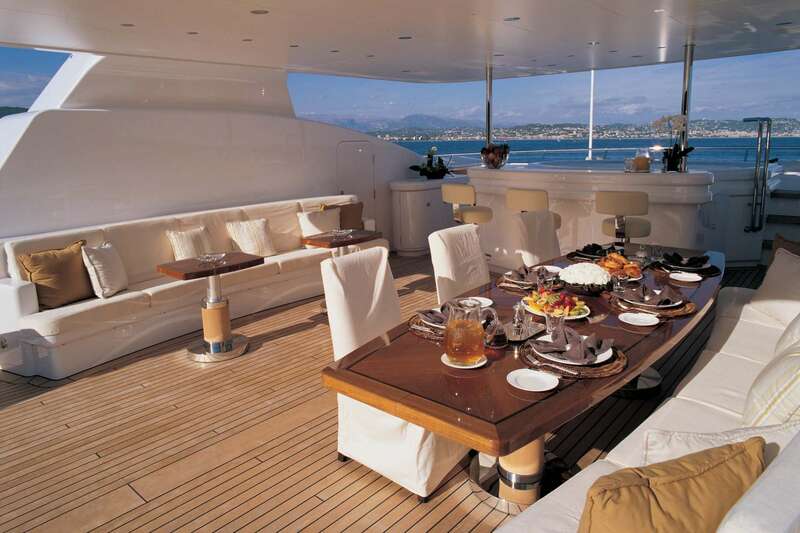 Seatel 4003 with the internet and email capability. 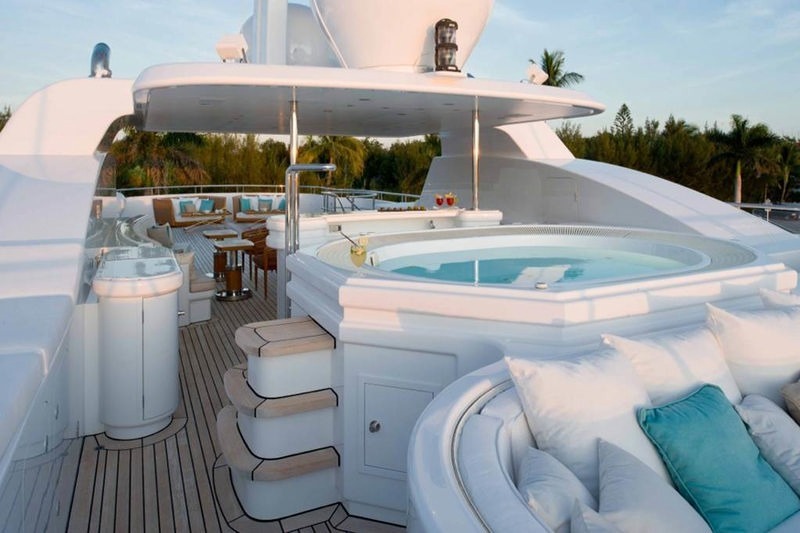 Wireless access to email and the internet. 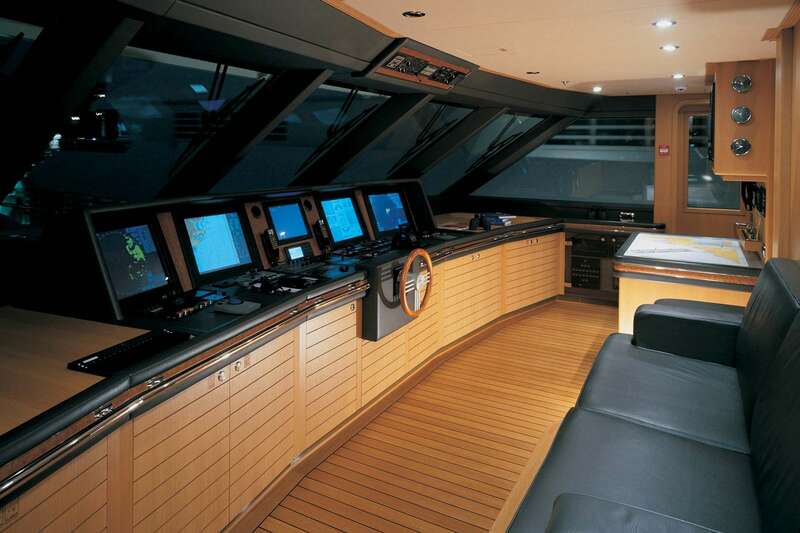 GSM phone and fax is also possible. 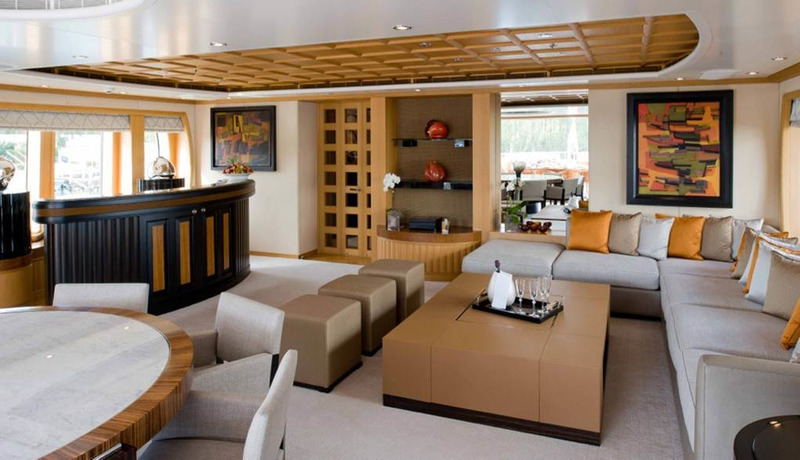 She has a Panaxonic (PABX) telephone exchange.